The projects featured below are samples of ADTEK’s overall portfolio. For more detail or to learn about additional project work, please contact us. 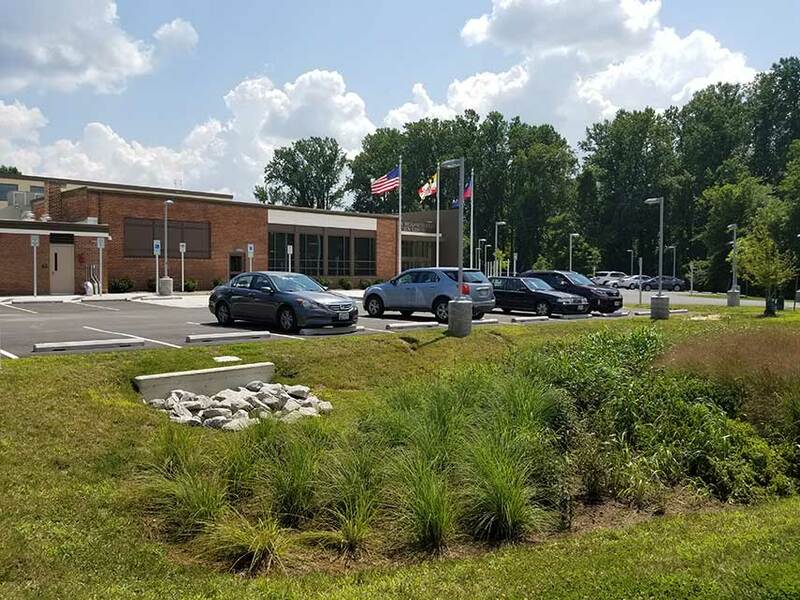 ADTEK provided civil engineering services for a new 32,000-sf library with approximately 170 parking spaces, as well as the redevelopment of Emancipation Park, adjacent to the facility. 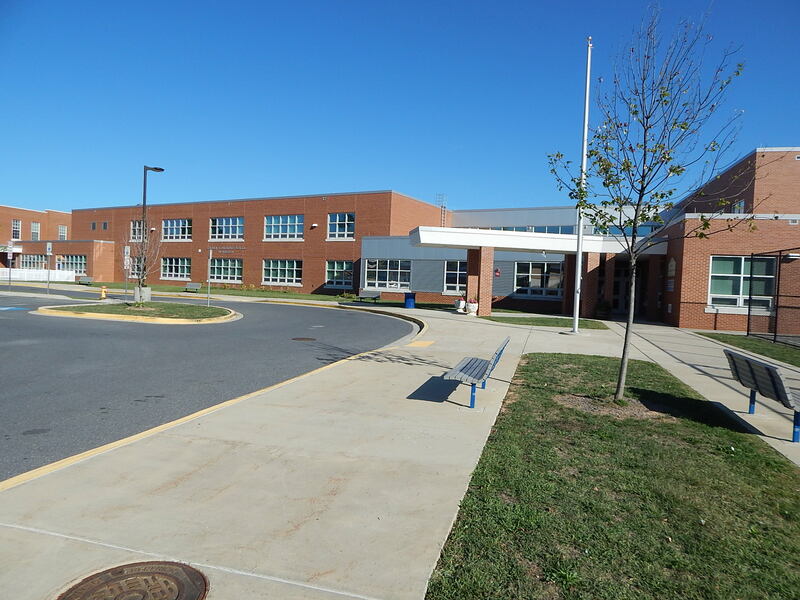 ADTEK provided civil engineering design for a new 92,000-sf elementary school on a 12-acre site in Frederick County, MD. 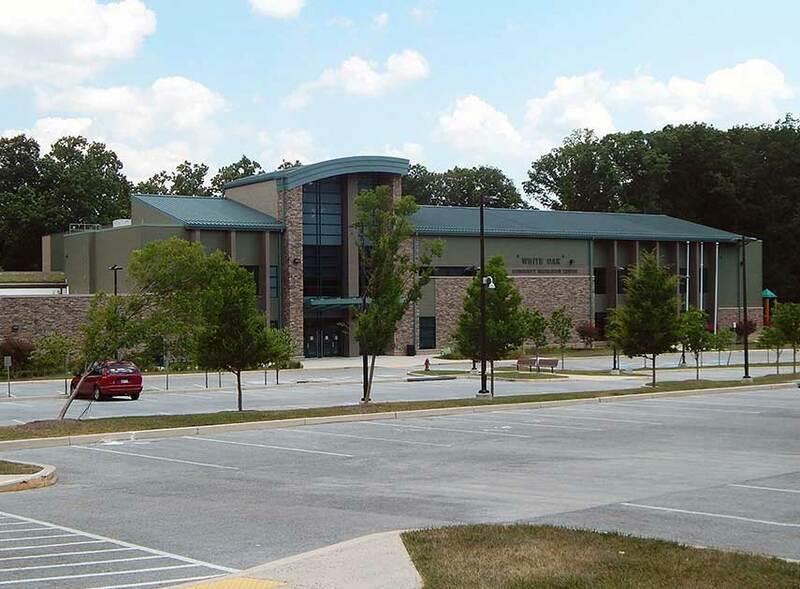 ADTEK provided engineering design services for a new 84,841-sf elementary school in Montgomery County, Maryland. 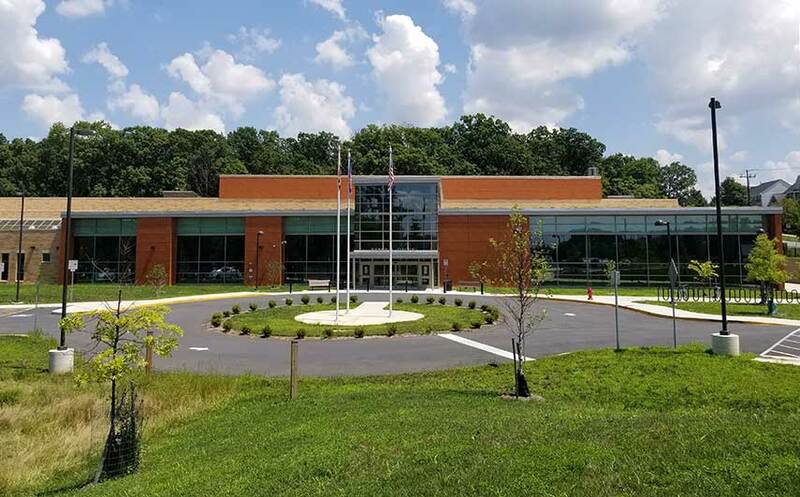 ADTEK provided civil engineering design for a new 96,350-sf elementary school, with a state rated capacity of 725 pre-K-5th grade, on a site that provided to the Frederick County Public Schools as part of an adjacent development. 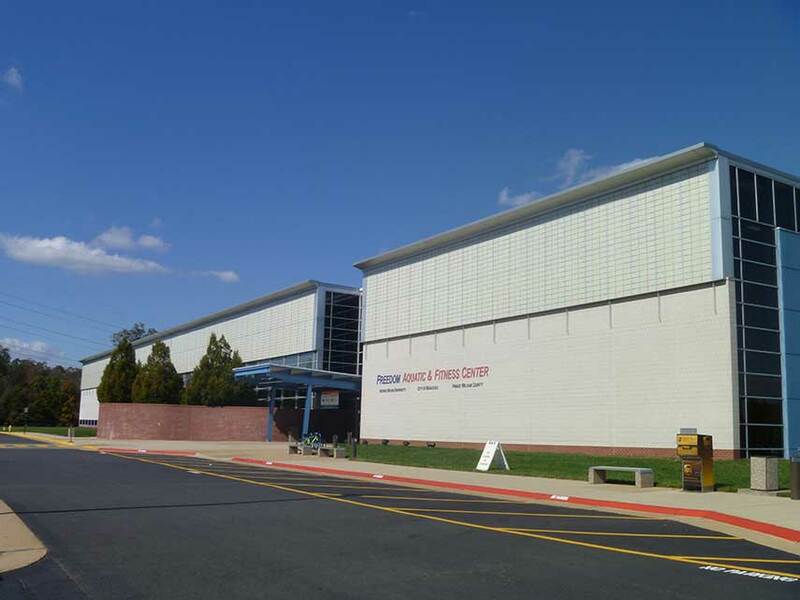 ADTEK provided civil and structural services related to the proposed renovations at the existing 39,192-sf ice rink and swimming pool facility. 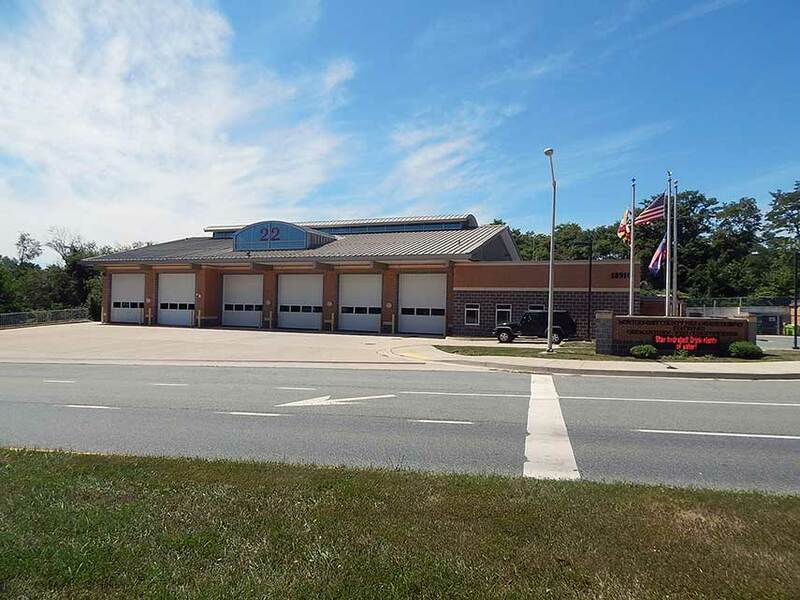 ADTEK provided structural engineering design for a new 12,000-sf, one-story, three-bay, drive-thru fire station, based on a prototype station design, with an additional bunk room and changing room of approximately 1,000-sf..
ADTEK provided engineering design services for a new 21,000-sf facility. 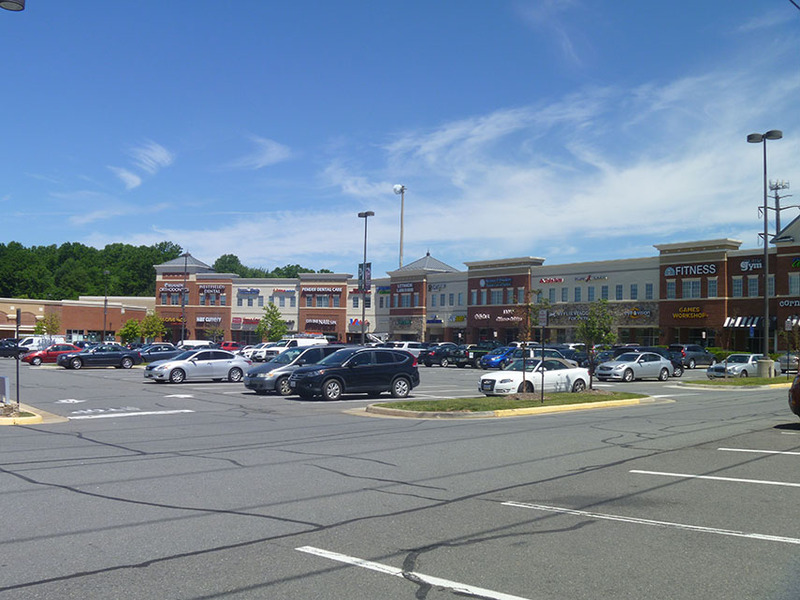 ADTEK provided design services for the new 18,000-gsf station serving the One Loudoun development and the entire Ashburn community. 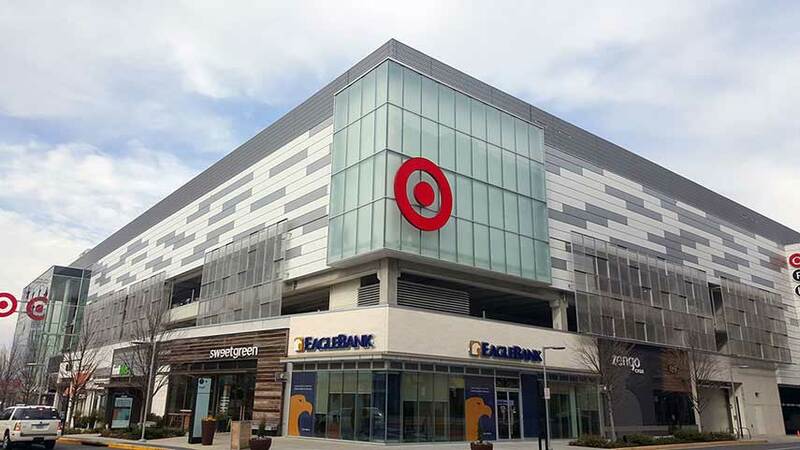 ADTEK provided specialty engineering for the exterior structural cold-formed steel for support of the exterior façade, including cladding and windows. 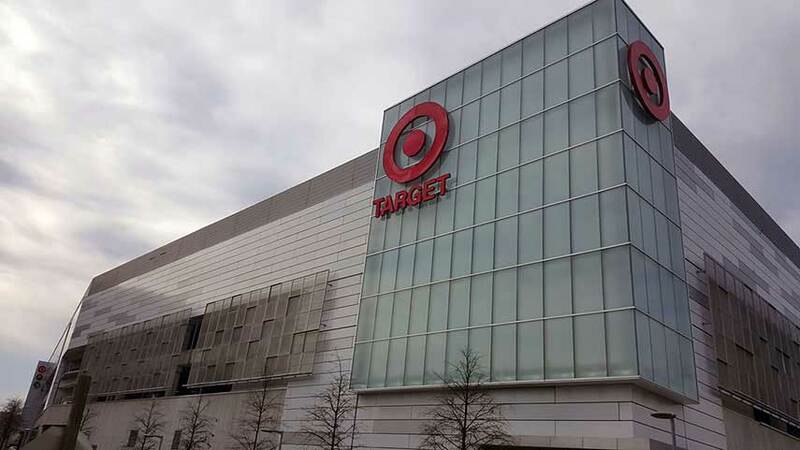 ADTEK provided specialty engineering for the exterior structural cold-formed steel for support of the exterior façade, including cladding and windows, including a metal panel that can be remotely color changed. 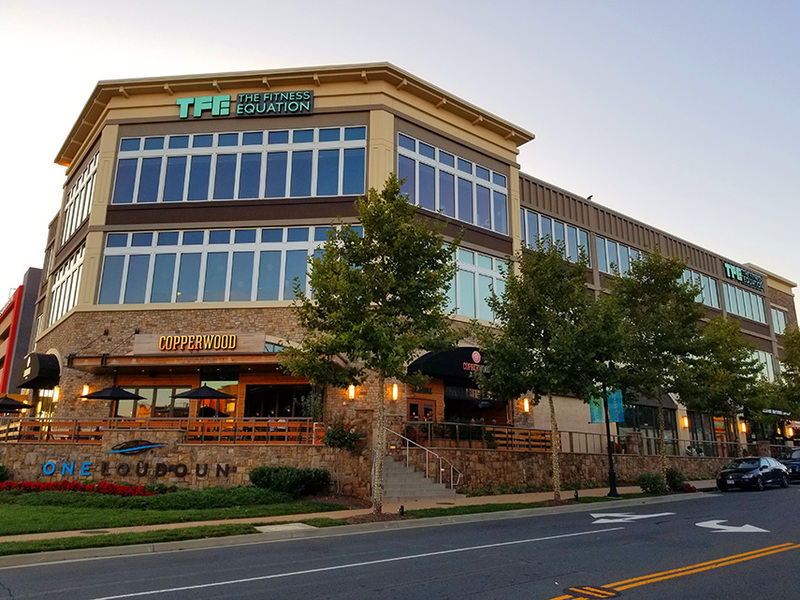 One Loudoun features 1,040 new homes including single-family homes, townhomes and multi-family homes; nearly 3 million sf of Class A office space and over 700,000-sf of retail, restaurant & entertainment. 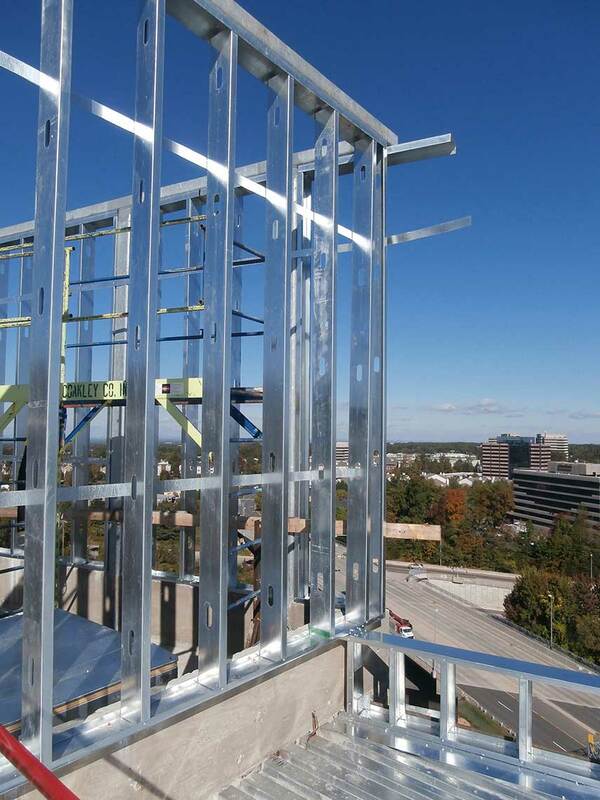 ADTEK provided structural cold formed framing design for multiple buildings within the development. 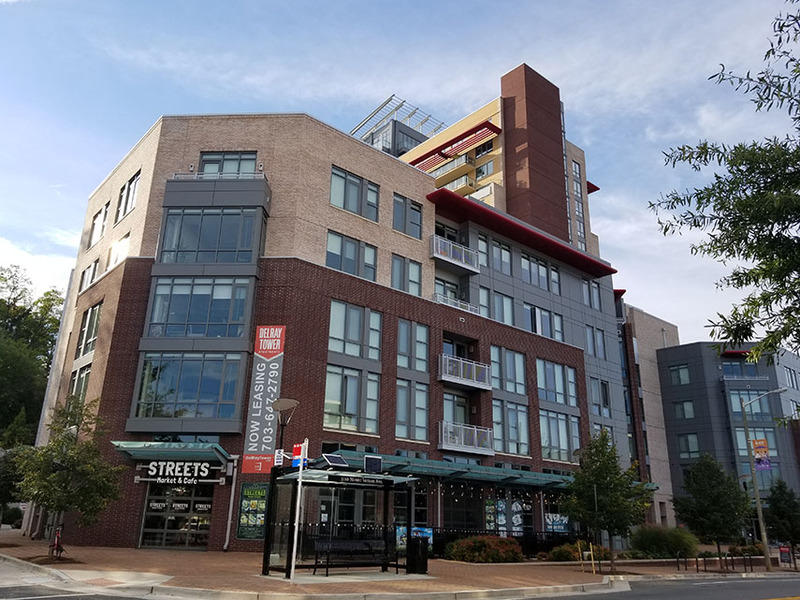 ADTEK provided civil and structural design services for the four-story, 140,000-sf building that includes one story of retail, three stories of residential, a penthouse floor and underground parking level. 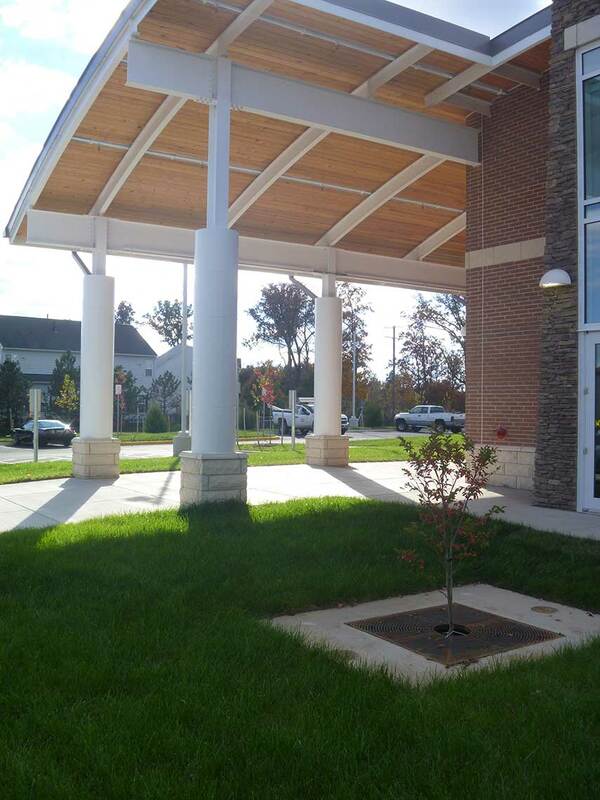 ADTEK provided civil design for a 48,084-sf community center and associated 17-acre site. The facility includes a gymnasium, playground, ballcourts, turf field, exercise room, social hall, kitchen, senior/community lounge, arts/kiln room, game room, vending space, conference room, offices, lobby, rest rooms and storage space. 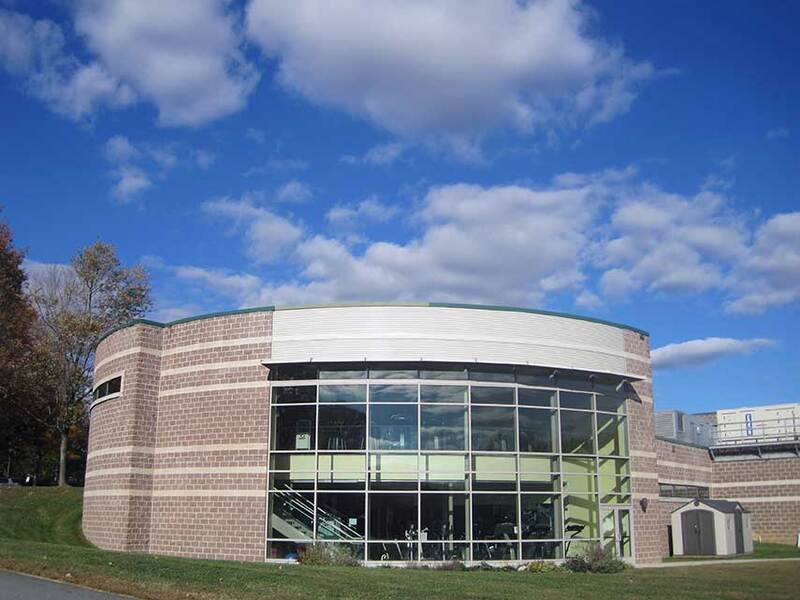 ADTEK provided civil engineering services for the renovation and a 13,250-sf expansion (gym and storage space) with site improvements for an existing recreation center. 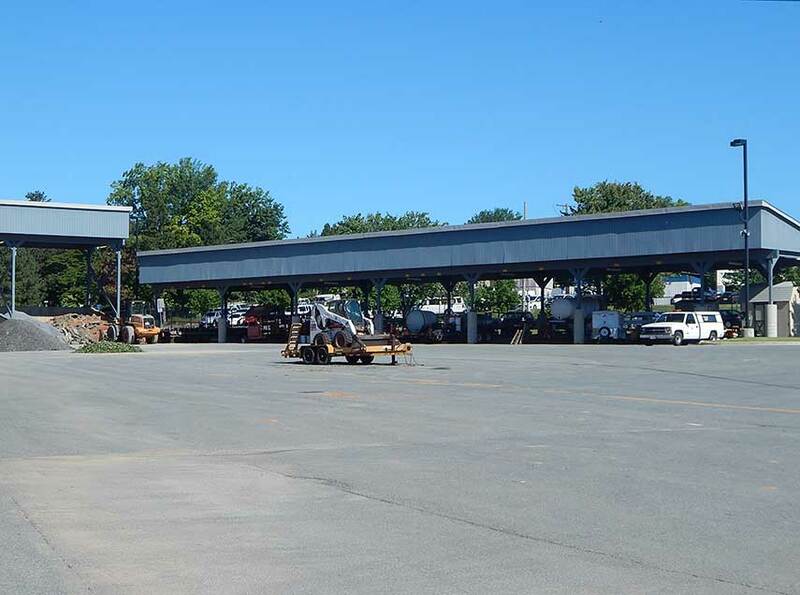 Site improvements included additional parking and bringing public water and sewer services to the building. 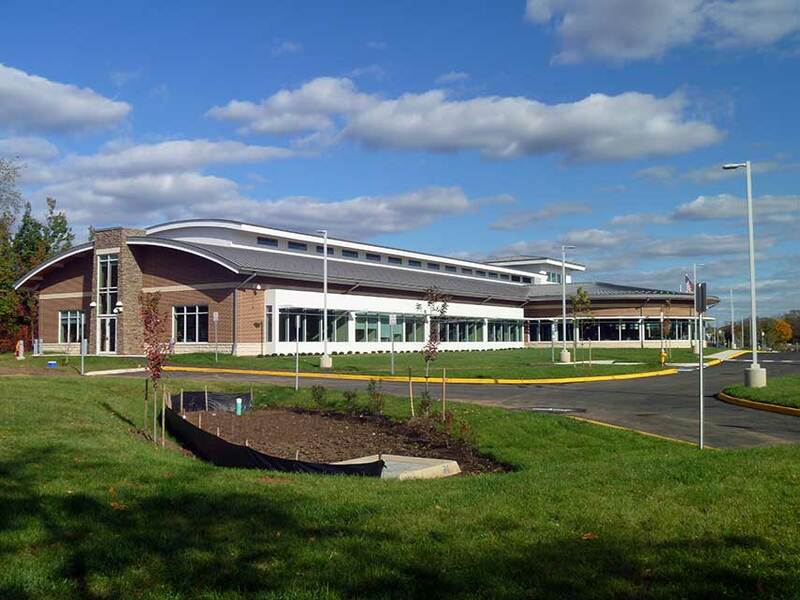 ADTEK provided civil design services for a 350,000-sf school on an 11.5 acre site. 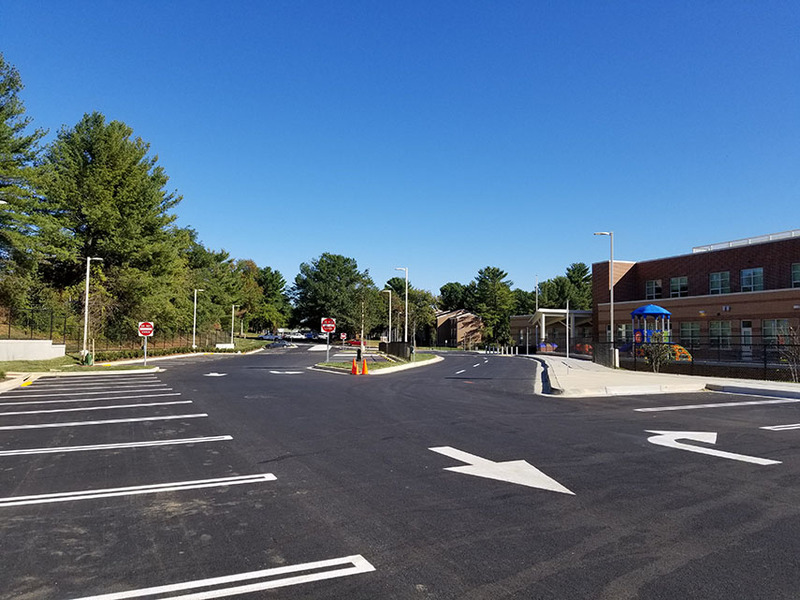 A new aquatics center replaced the adjacent facility and a new traffic pattern around and on the site improves safety and mitigates the visual impact of surface parking. 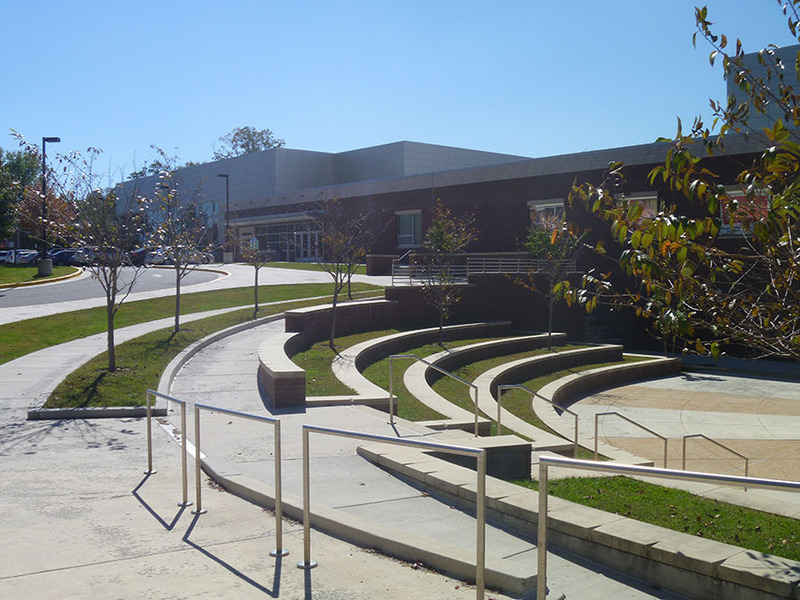 The design also integrated a 2004 classroom addition, renovated the existing auditorium, and established a central courtyard and a new entry plaza. Construction was phased to allow the school to maintain its functionality throughout each step. 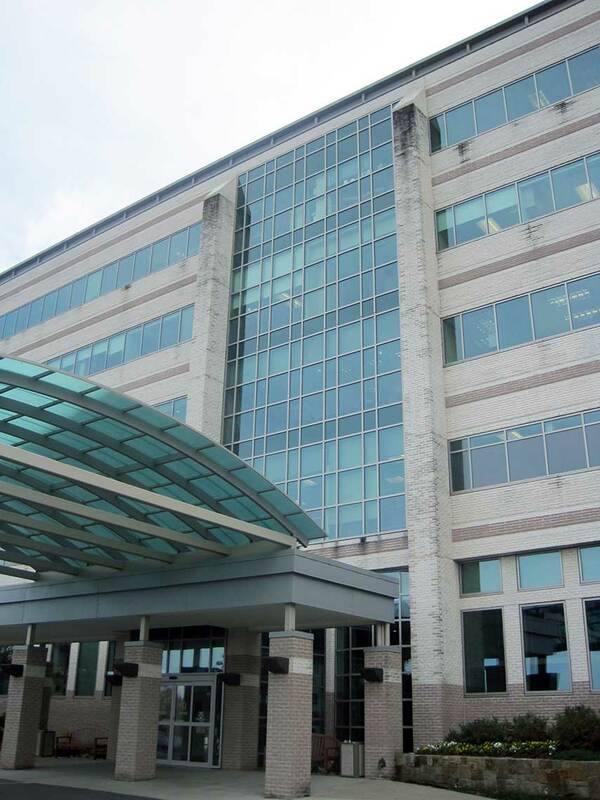 ADTEK provided design services for the modernization of a 340,000-sf replacement to an existing, outdated facility. The school accommodates 1,800 students with capabilities to meet future enrollment needs of up to 2,400. 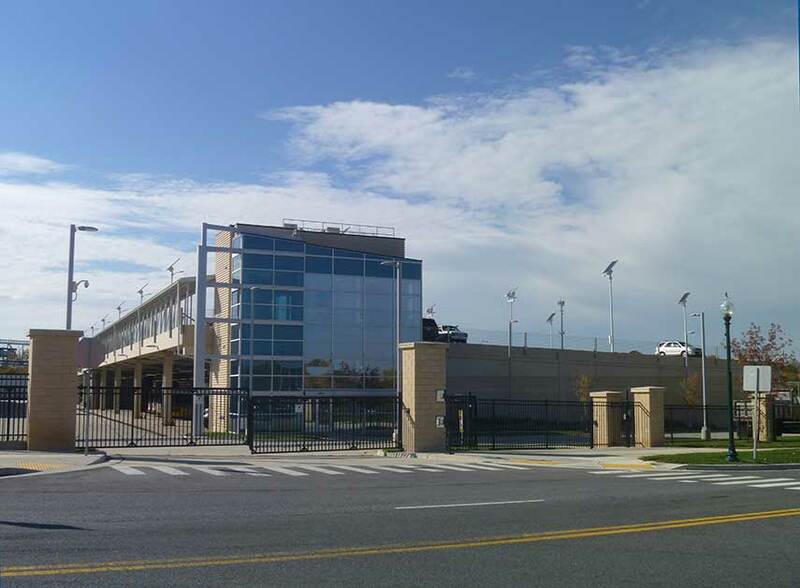 The project also involved the design of the complete athletic program, including the baseball field, soccer field, softball field, standalone track and field (i.e. not integrated with the football field), football field, tennis courts, basketball courts, practice fields and associated ticket booths and bleachers. 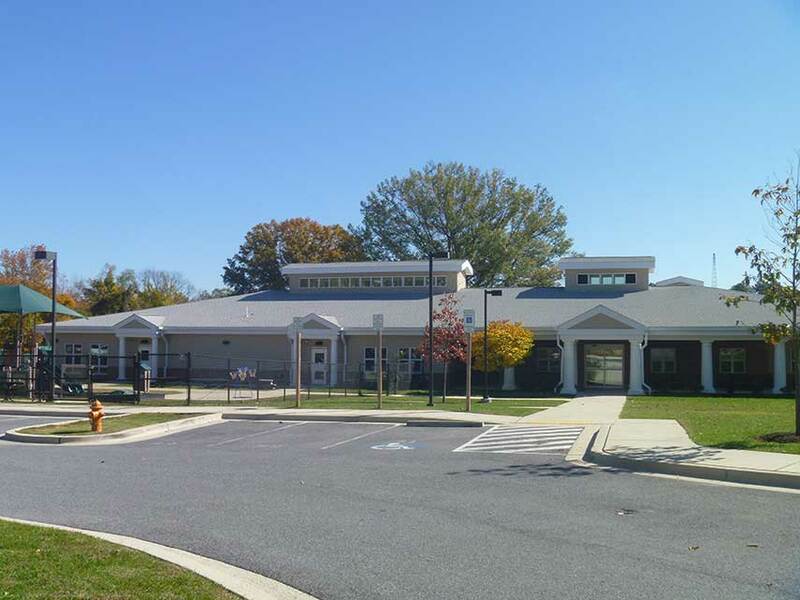 ADTEK provided engineering design services for the 95,000-sf renovation of and additions to the existing 89-year-old Lincoln Elementary School in the City of Frederick which had additions made to it in 1938, 1953, and 1974. The new Lincoln comes equipped with an energy-efficient geothermal heating system, a two-level library, a full-sized gym, a new cafeteria, media center and modern computer rooms. 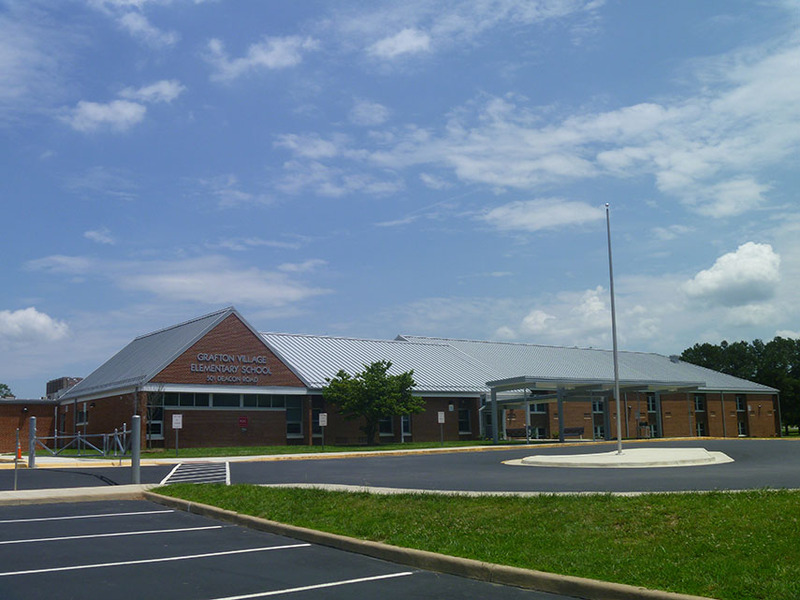 ADTEK provided design services for renovations and additions to the existing Clermont Elementary School. 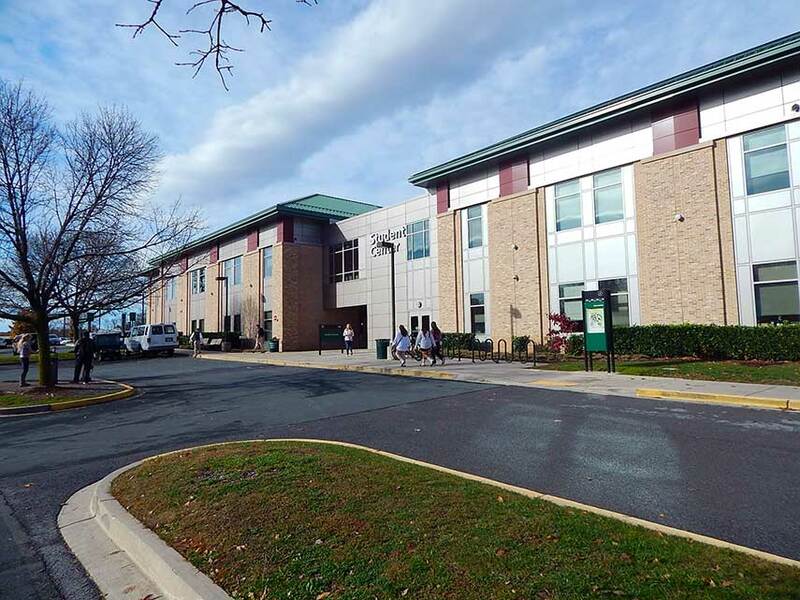 Interior renovations to the existing 50,600-sf school included reconfigurations to the existing space and ADA compliance. 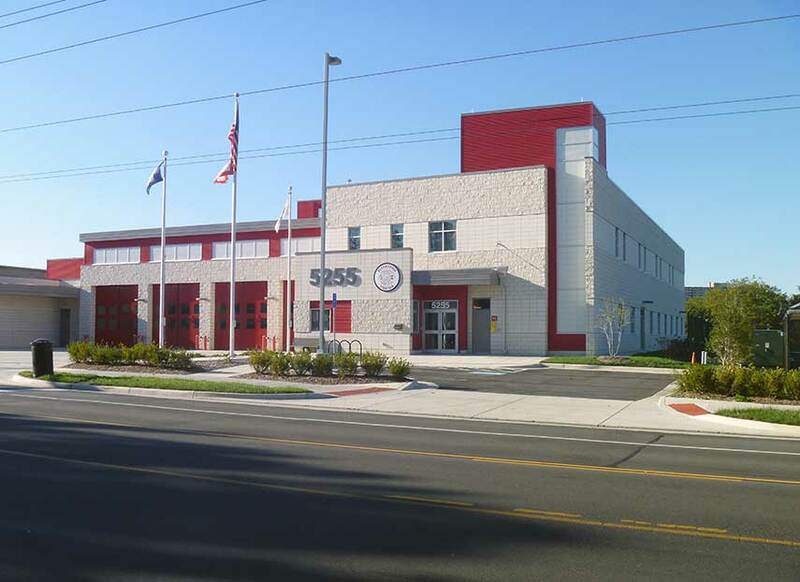 A 15,000-sf addition was included in the scope. 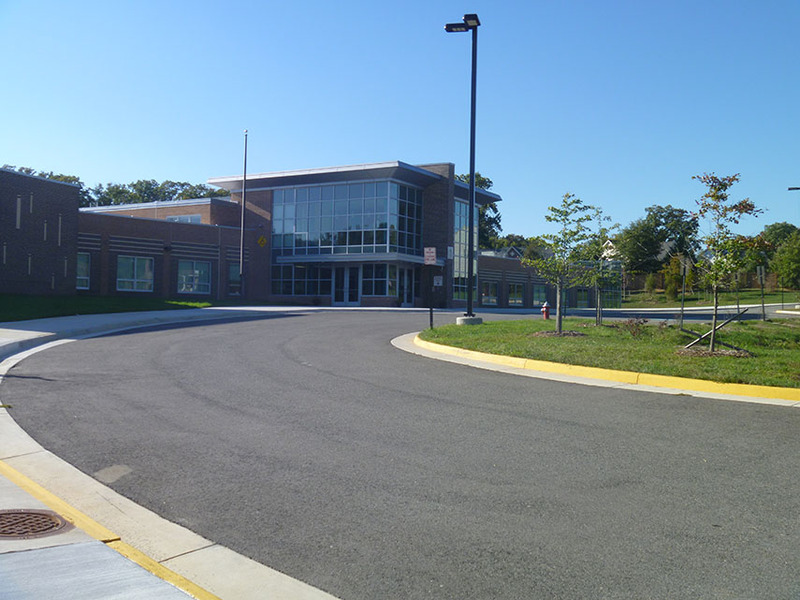 The site work was typical of elementary school renovation/renewal projects for the Fairfax County Public Schools. 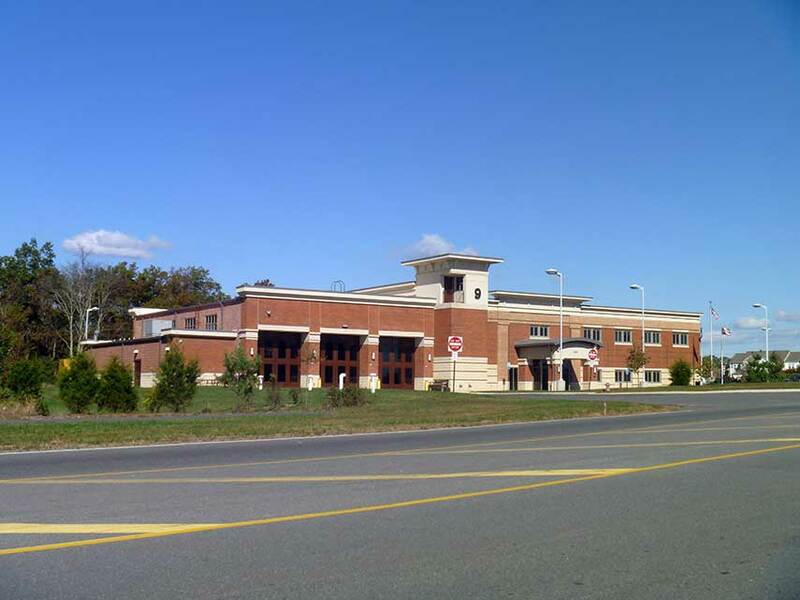 ADTEK provided civil design services for the demolition of the existing school and construction of a 142,507-sf replacement school. 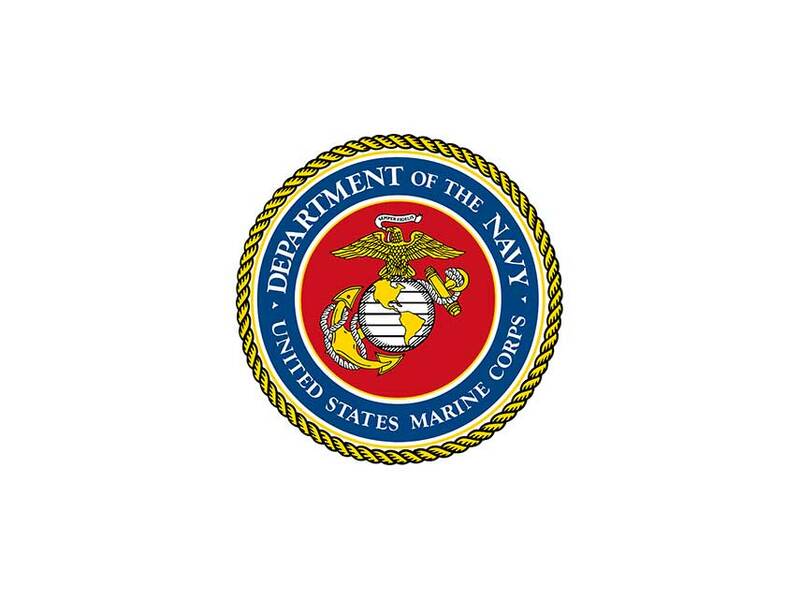 The project included the design of a 96” diameter CMP underground detention system. 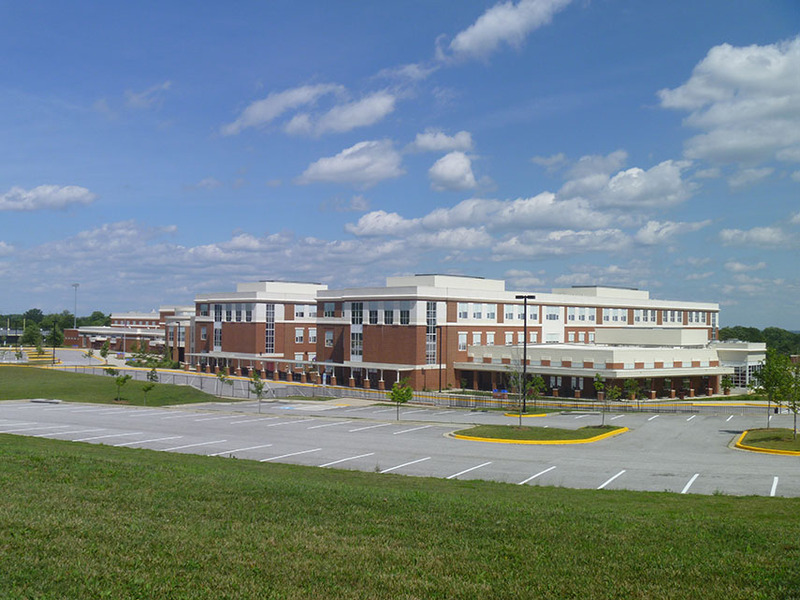 The two-story school contains four wings: classroom, cafeteria and music, gymnasium, and media center/administrative. 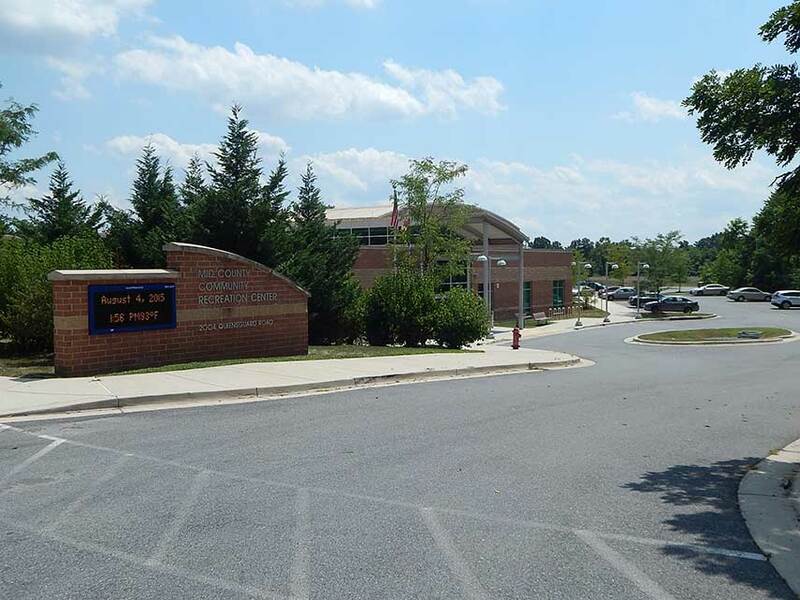 This is the first middle school in the State of Maryland and the Mid-Atlantic region to be LEED® certified and the fourth middle school in the country to obtain LEED® Gold. 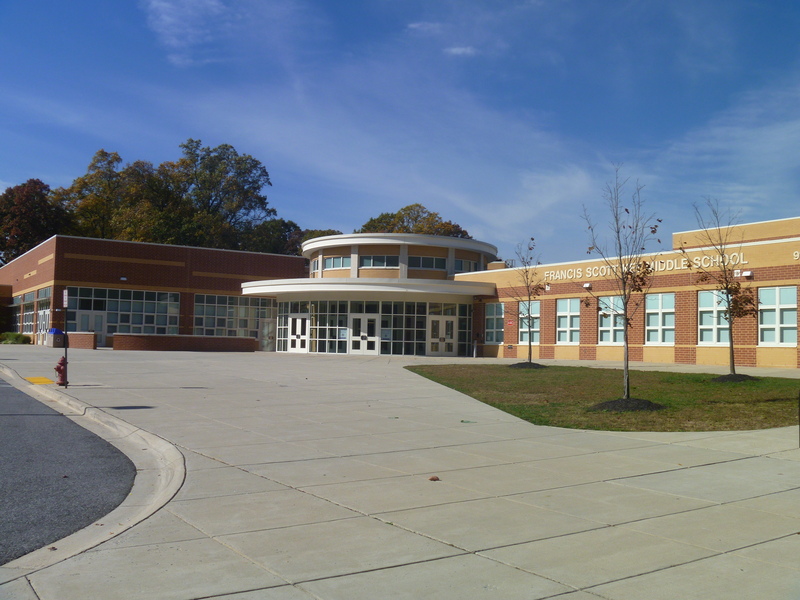 ADTEK provided design services for the renovation and single-story addition to the school. 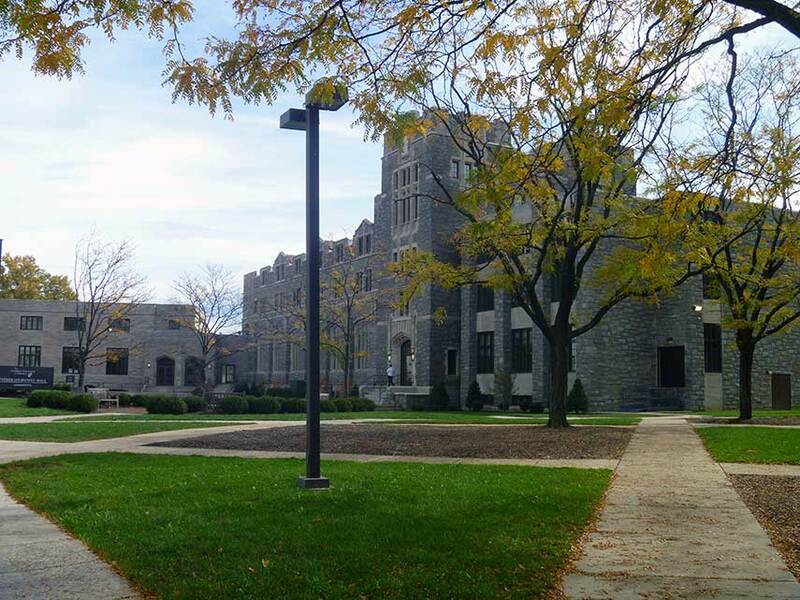 The addition includes a new library, a music room , an entry vestibule and corridor expansion and a main entry. 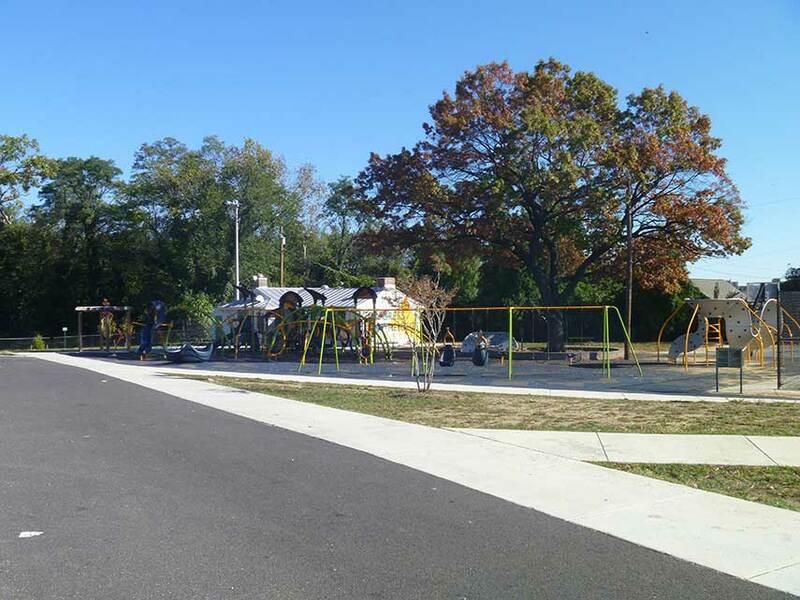 Site improvements include the relocation of playground area, new fire line, new asphalt play area, new electrical equipment yard and screening, new dumpster enclosure, removal and rework of existing chiller equipment yard, and new/replaced concrete walks. 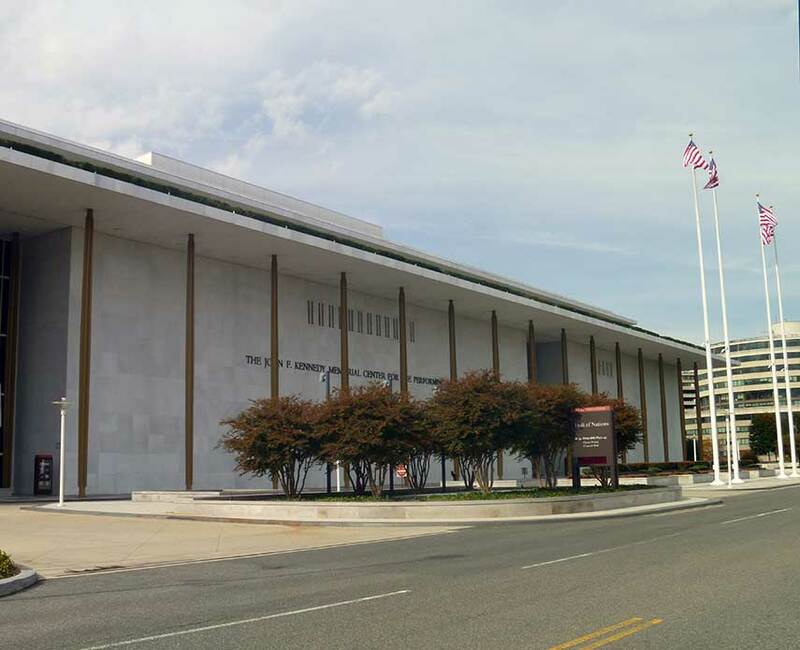 Improvements to Lincoln Memorial walkways to make them compliant with the Architectural Barriers Accessibility Act Standards (ABAAS). 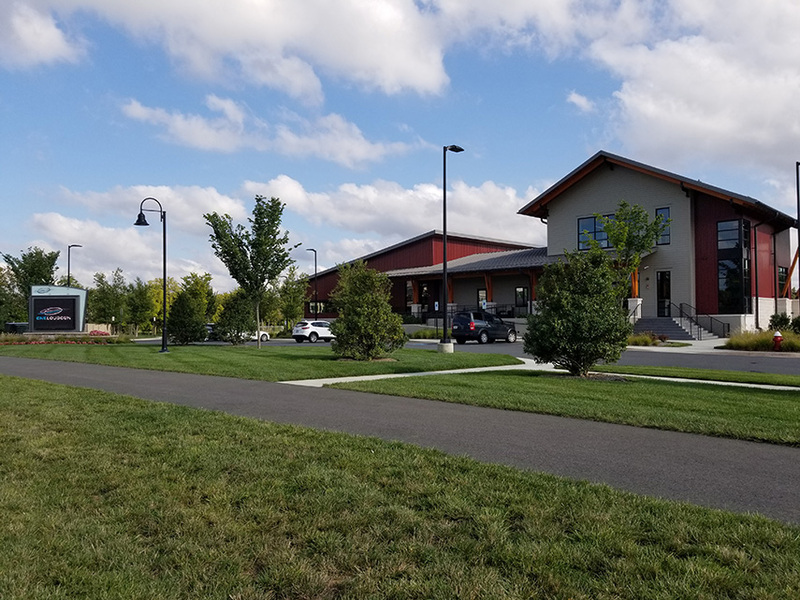 ADTEK provided design services for a 23,500-sf recreation center that includes a social hall, gym, kitchen, exercise room, arts-and-crafts room, senior lounge, conference room, music room, multi-purpose room, and fitness room. 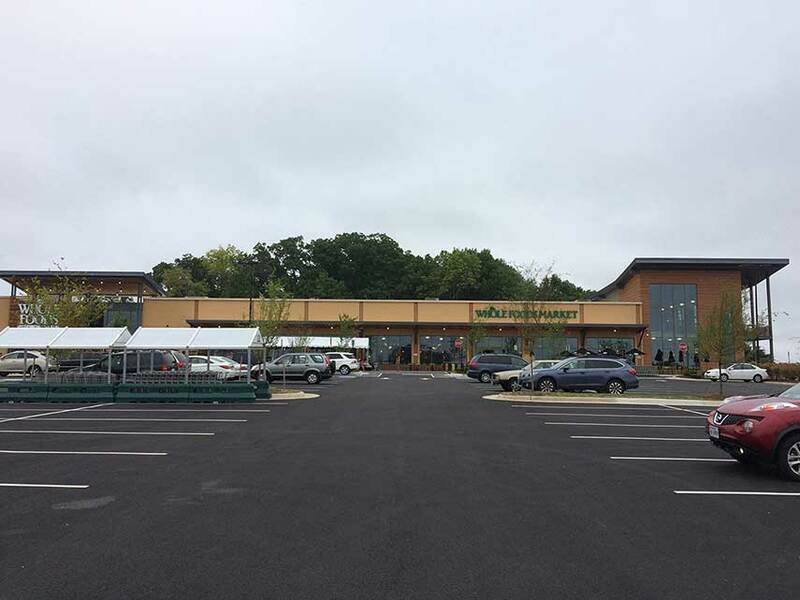 The center serves an existing growing community. 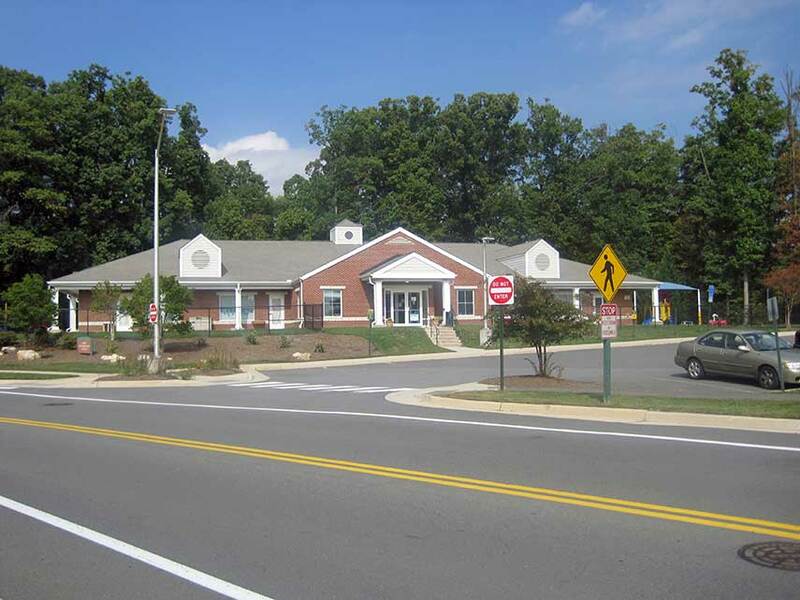 ADTEK provided master planning services that included the sharing of resources with a proposed elementary school, a park, and community center. 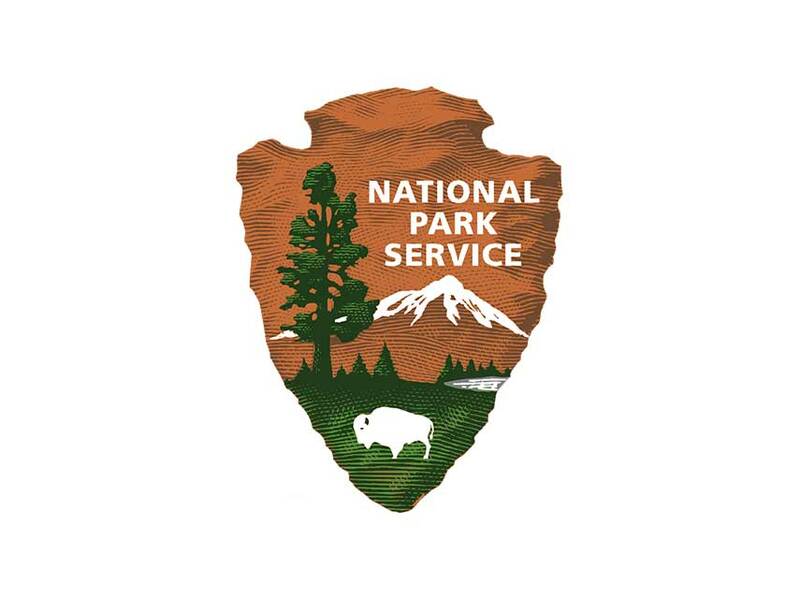 Additionally, the project required a bike path, extending from the parking area, connecting with the Matthew Henson Trail and over fourteen miles of the Rock Creek Hiker-Biker Trail. 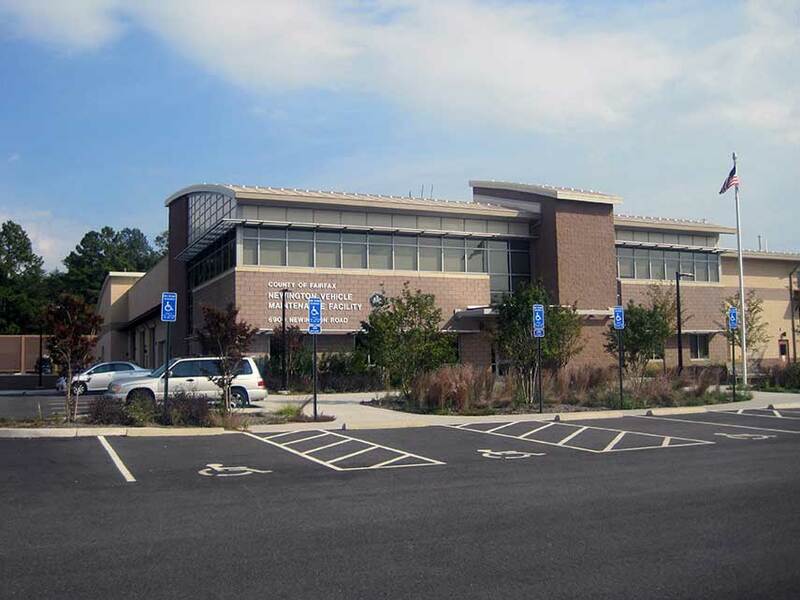 Client: The Lukmire Partnership, Inc.
ADTEK provided design services for the new 44,000-sf library. 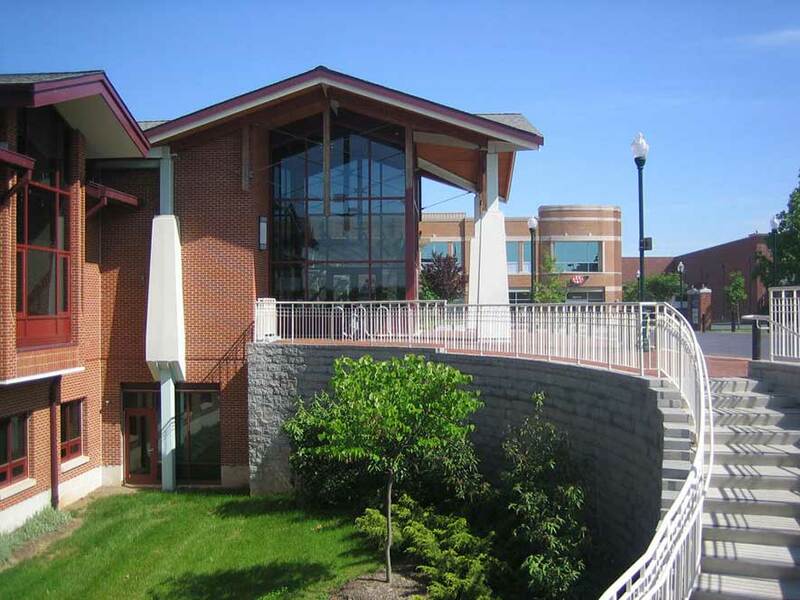 This two-story facility houses 200,000 volumes, childrens areas, quiet study rooms, and a young adults mezzanine. 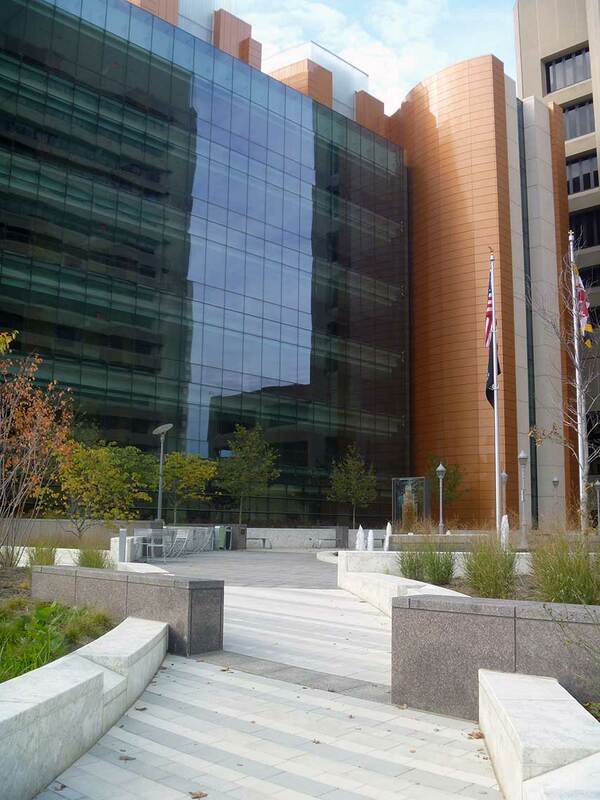 ADTEK provided design services for the new 90,000-sf library, located within Silver Spring’s Central Business District. 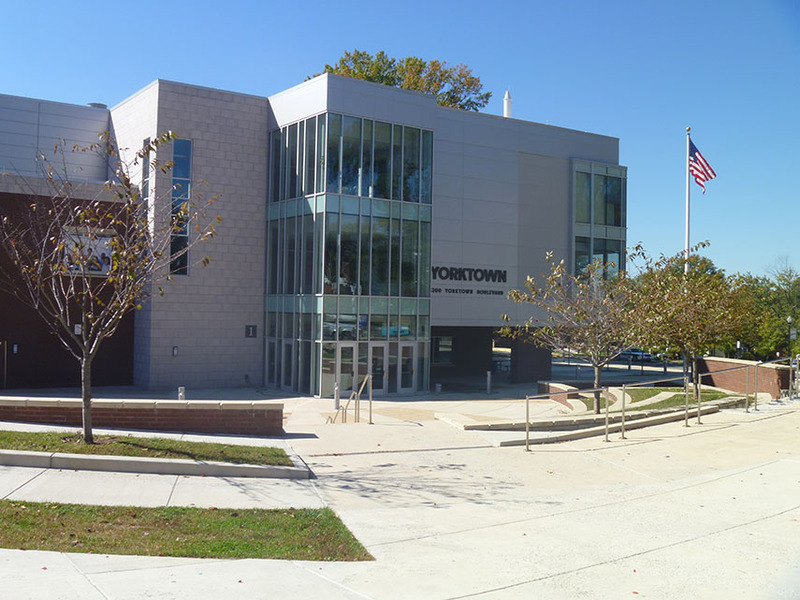 The footprint of the library’s first floor is split by the right-of-way for the future Purple Line light rail station, resulting in a main building, with a “Pavilion” along Fenton Street. 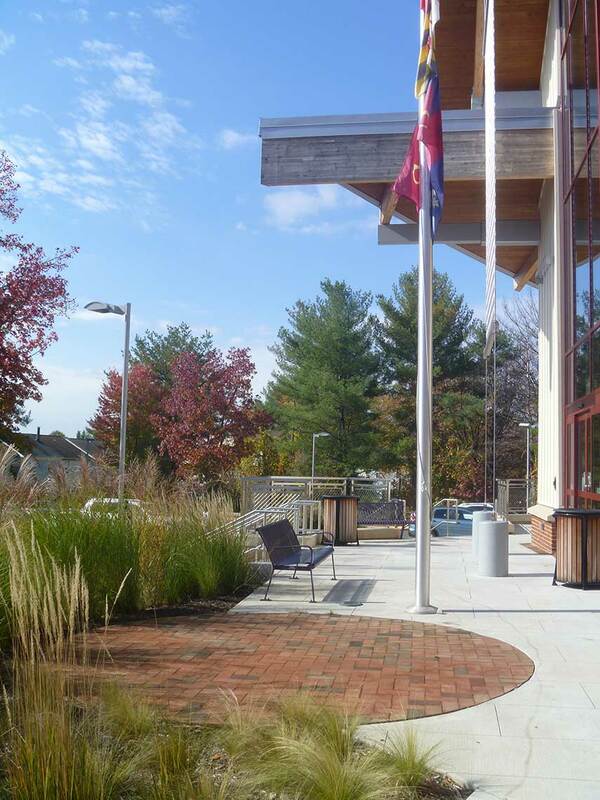 The main building features a vegetated roof and the roof of the “Pavilion” for stormwater management. Client: C.J. 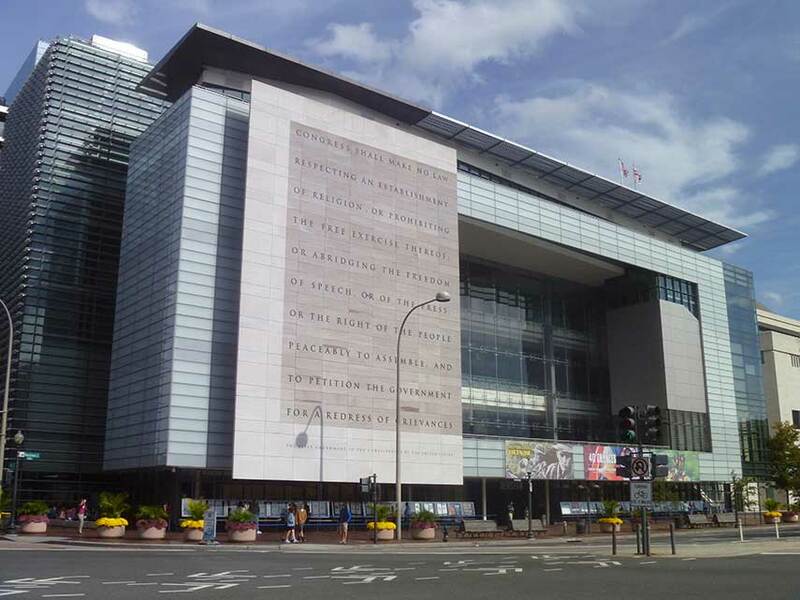 Coakley Co. Inc.
ADTEK provided specialty engineering design services for the seven-story, 250,000-sf interactive museum of news and journalism, located in downtown Washington, DC. 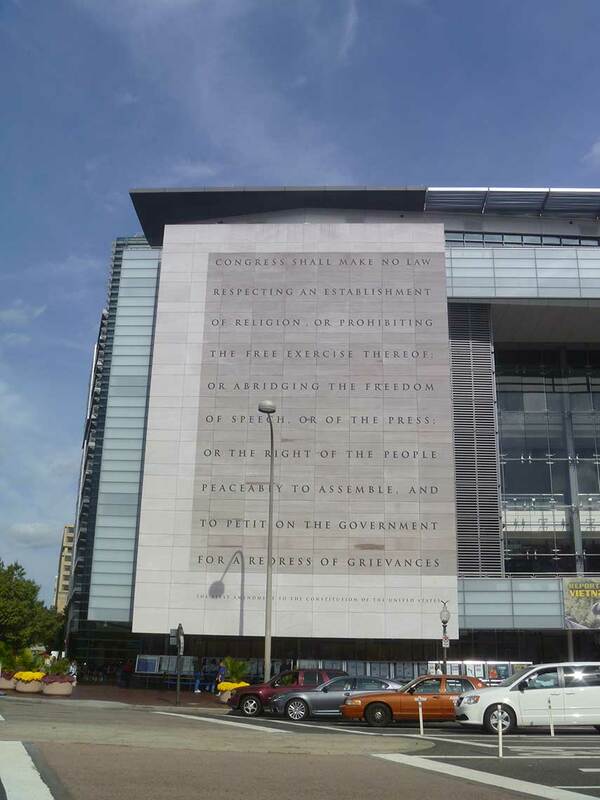 ADTEK’s specialty engineers provided design for light gauge framing for the building’s exterior, as well as a structural support system for the exterior stone First Amendment Wall feature. Interior design components included support structures for acoustical windows and cold–formed steel supports for interior window sills. 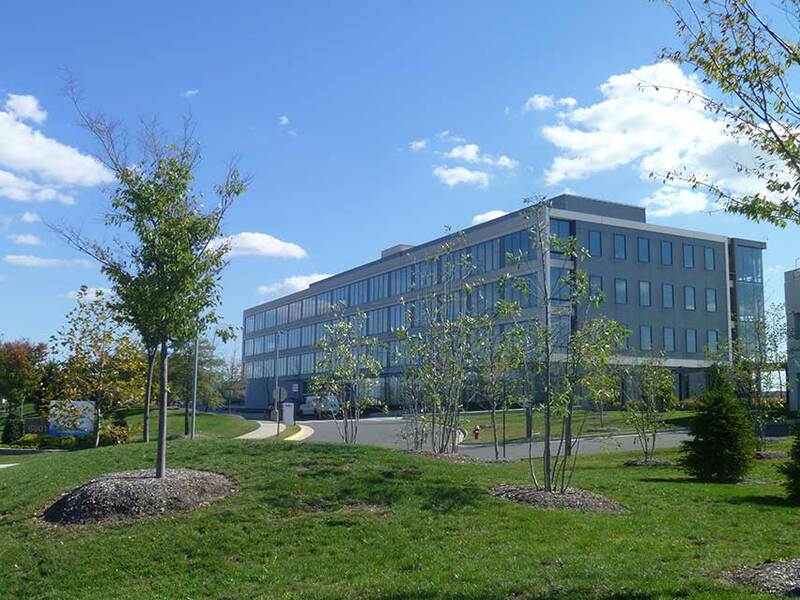 ADTEK provided design services, under a design-build contract, for the new, approximately 39,433-sf, three-story facility that includes six bays, offices, residential amenities, classrooms, and an exercise room. 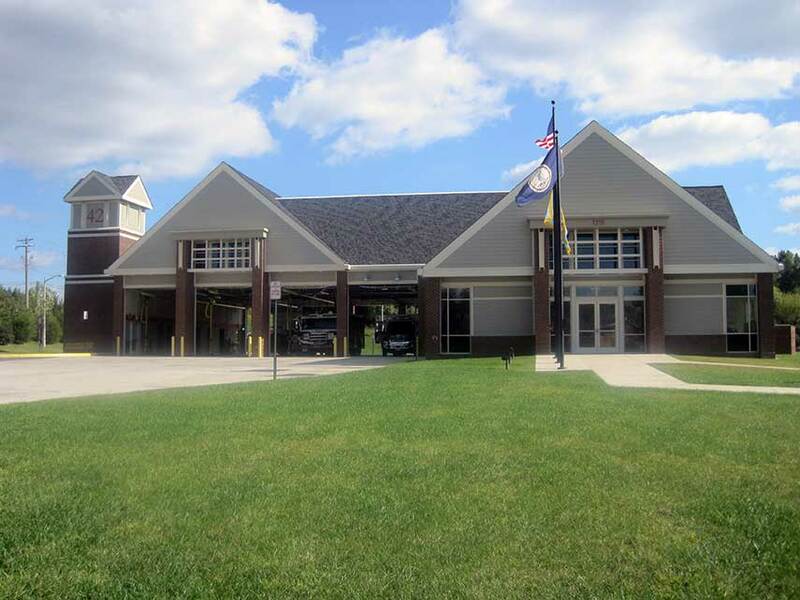 Associated with the station is a separate parking lot with approximately 85 parking spaces and a new impound parking lot of approximately 124 parking spaces. 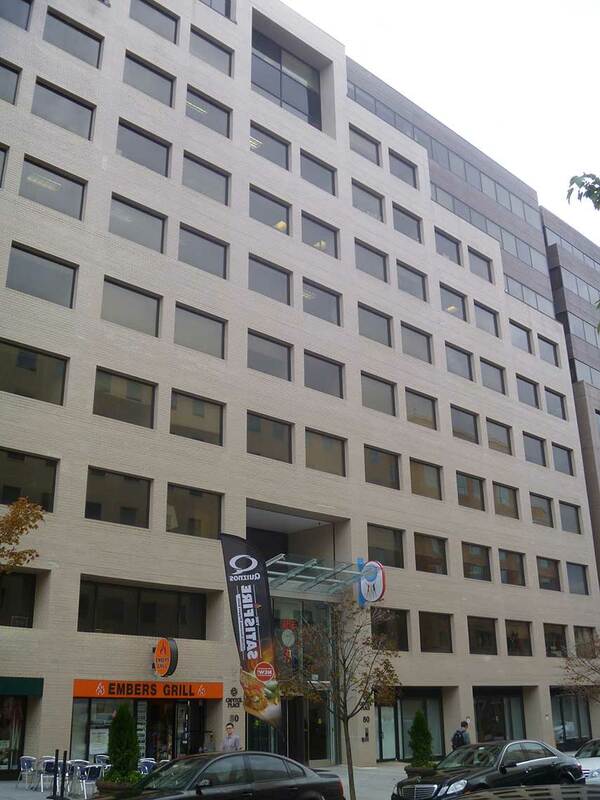 ADTEK provided civil design services for the new five-story, 122,600-sf office building. 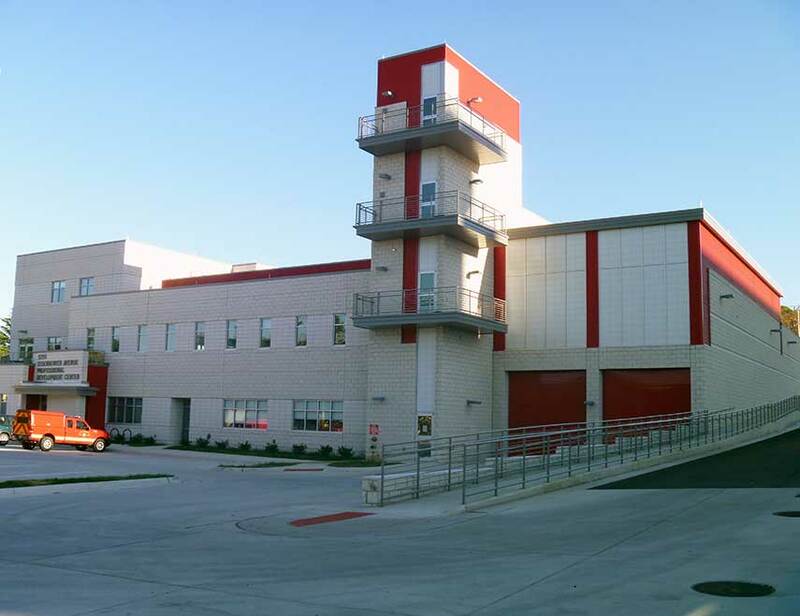 The facility includes a 530 space parking garage and an 84,700-sf, one-story industrial building. Stormwater management consists of an approximately 70’x130’ underground vault for stormwater detention and three storm filters for water quality (BMP) requirements. ADTEK’s structural engineers provided design services for the vault. 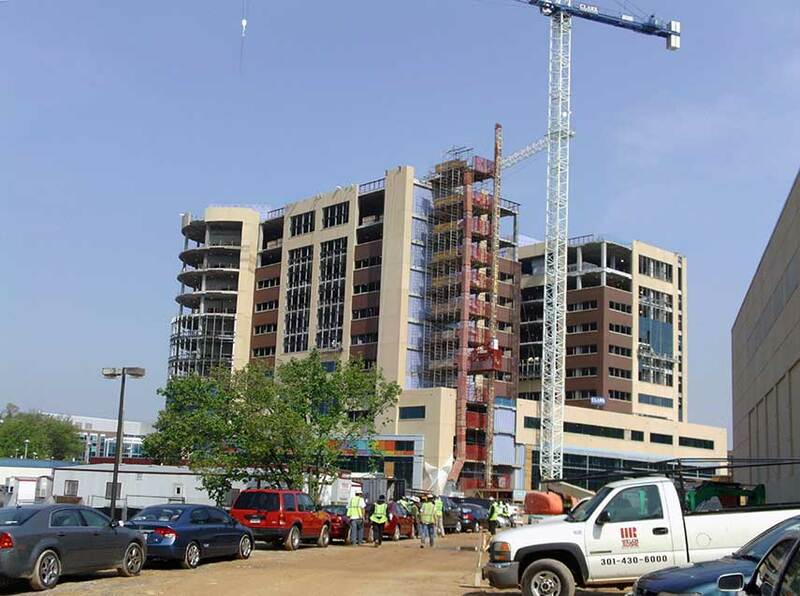 ADTEK, under a task order contract through Setty & Associates, has done numerous projects including office renovation design, new equipment supports, load studies and the parking garage work for the IMF in the past 15 years. Separate from the task order contract, ADTEK provided structural design services to renovate the 3 and 4 level below grade garage in IMF’s Headquarters One building. 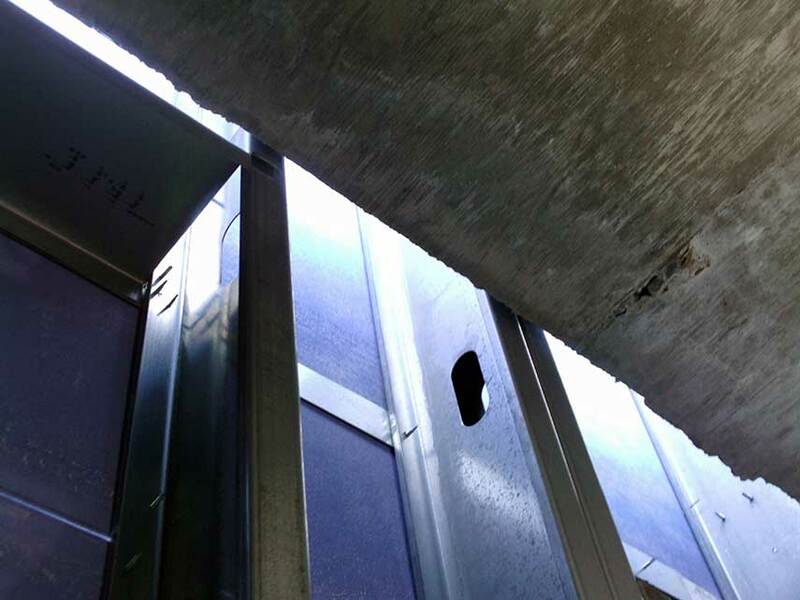 ADTEK provided structural design services for the replacement of corroded reinforced existing elevated steel beams underneath the existing 500,000-lb cooling towers that remained in operation during renovations. ADTEK provided structural cold formed framing design services for the rooftop mechanical penthouse, an analysis to determine controlling lateral load for design (wind or seismic), cold formed erection plans, interior stone at the main lobby wall, interior raised bench support, roof parapet and design of exterior rigid soffit cold formed joists at the lobby canopy, windowsills, headers and jambs. Cold formed wall sections were coordinated with the structural drawings. 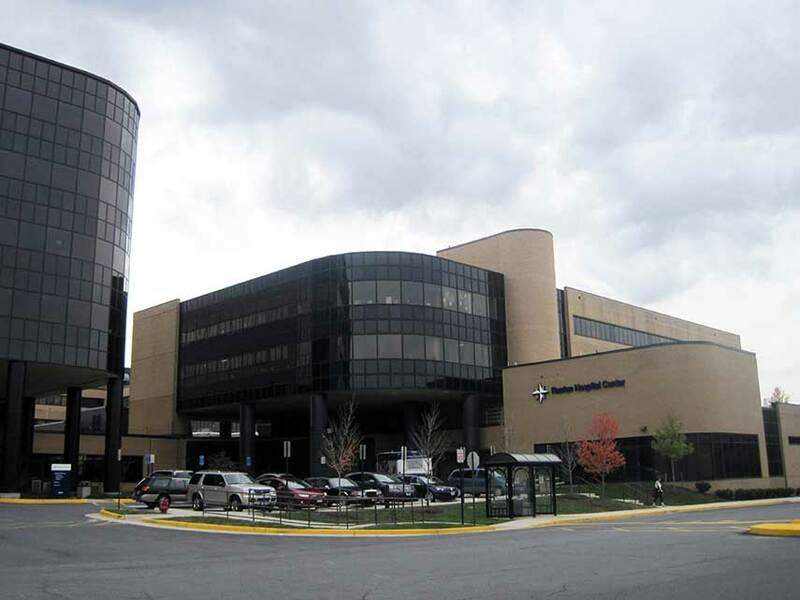 ADTEK provided design services for a 100,000-sf, four-story medical office building addition to an existing 1974 facility. 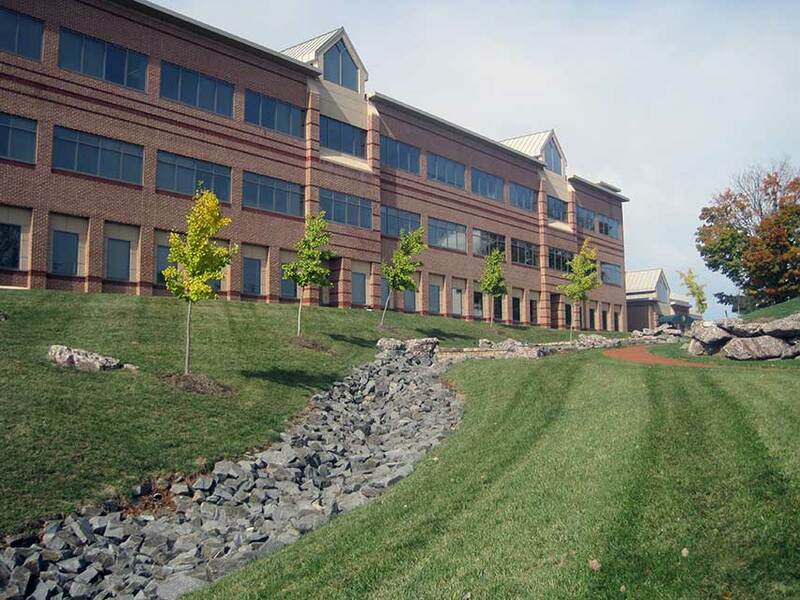 Services included layout, grading, drainage, erosion and sediment controls, utility plans and profiles, site details, a stormwater management impact assessment, a detailed analysis of the existing site hydrology and facilities to determine if the existing on-site facilities could accommodate the proposed building addition. 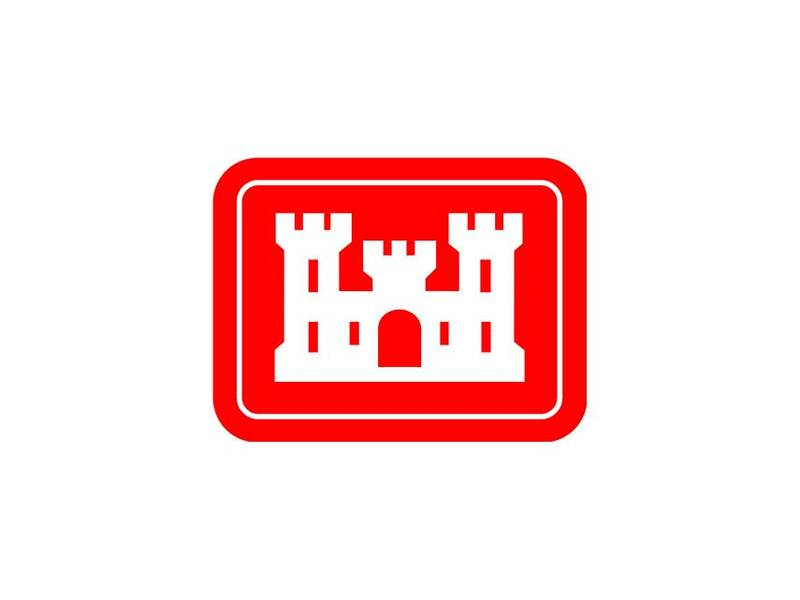 Structural services included the design of three check dams to help facilitate ground water infiltration. 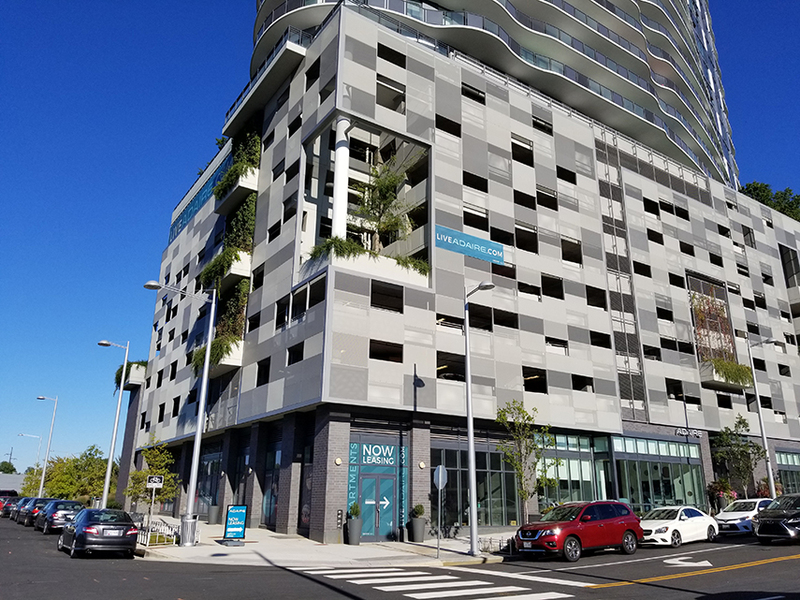 ADTEK provided structural design services for a feasibility study and reports for the 32,000-sf vertical expansion of an existing twelve-story office building with a mechanical penthouse over a three-level below grade garage on a mat slab foundation. 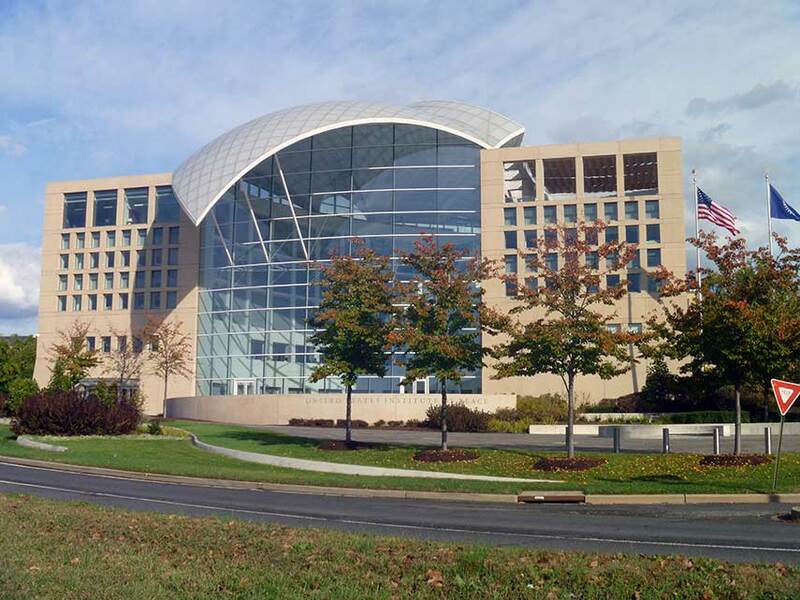 Under a separate contract with the AFGE, ADTEK provided structural design services for a garage level lobby ramps, lobby renovation, entry canopy and print shop additional floor load study. 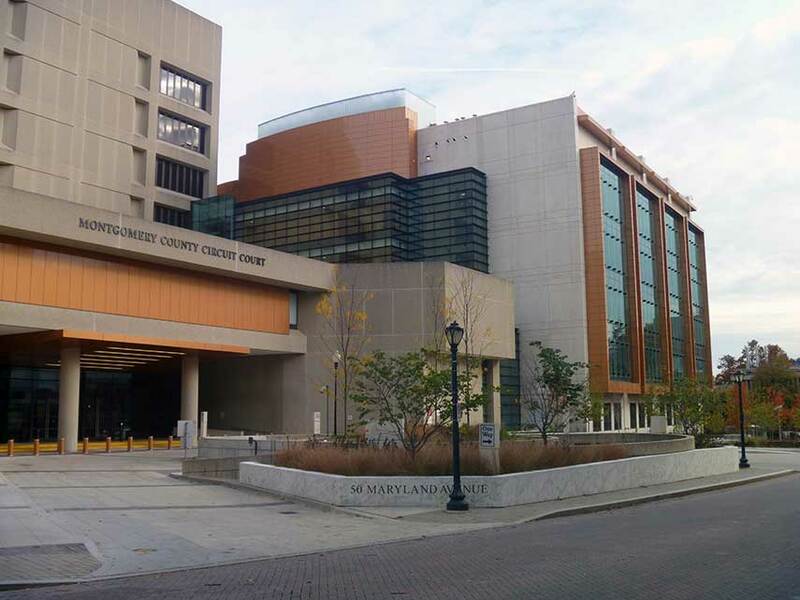 Client: Michael Baker Jr., Inc.
ADTEK provided design services for the new EMTOC to replace the previous undersized and outdated facility at Shady Grove as part of the County SmartGrowth initiative. The campus consists of 13 buildings on two adjacent sites. 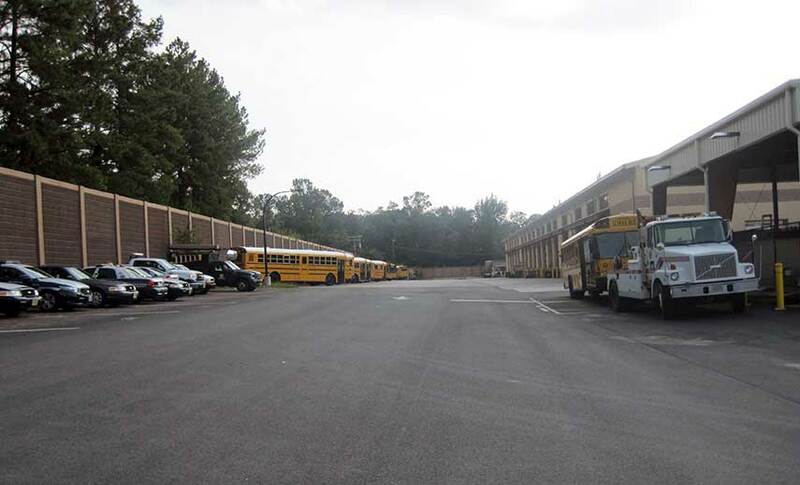 The campus accommodates parking and storage for a fleet of 200 buses, along with 581 employees and a fleet of heavy-duty maintenance vehicles. Building sizes are 100,000-sf+. 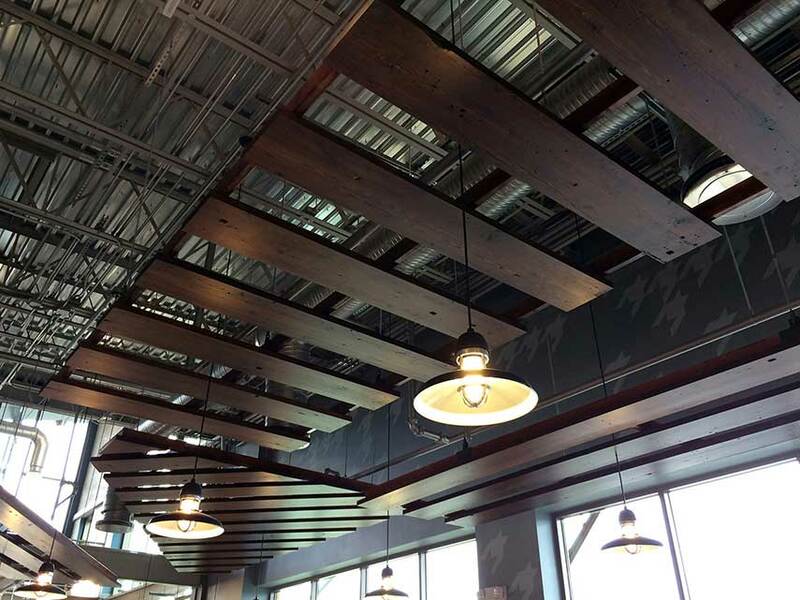 The 12 buildings ADTEK provided structural design services for feature various structural systems including high bay steel framing, masonry and wood framing. ADTEK also had to design and relocate sanitary sewers, storm drains and waterlines. A road was extended and a stream relocated. 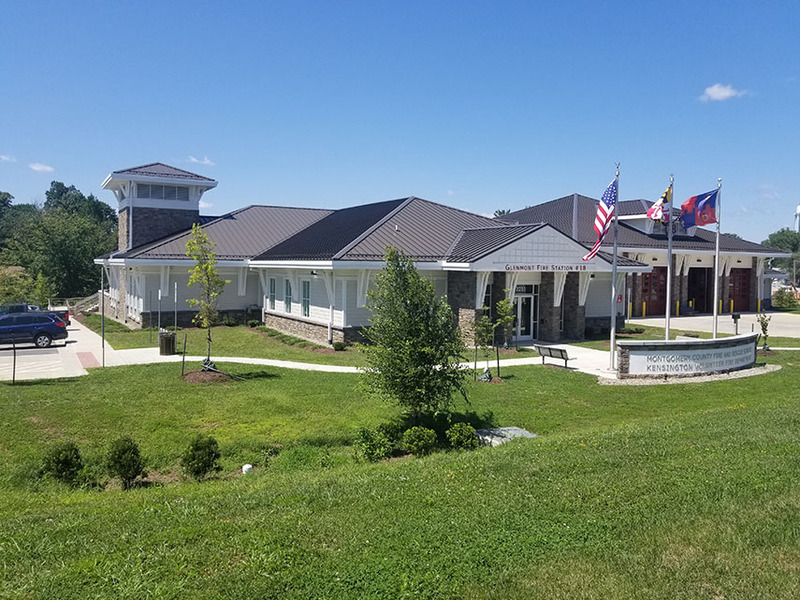 ADTEK provided civil design services for the renovation/expansion of the existing site and the evaluation of the South County Animal Shelter, located on the adjacent site. 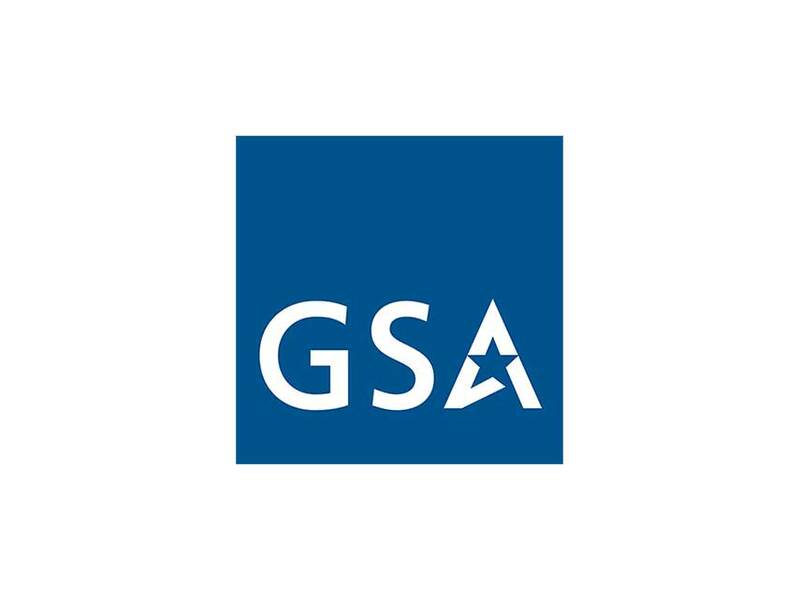 Design services included site layout and grading, utility plans and profiles, sediment control, storm drainage design, stormwater management, LID facilities, coordination with sub-consultants for flood plain, Resource Protection Area (RPA), and Water Quality Impact Assessment (WQIA), watershed planning, permitting, construction document preparation and construction administration. 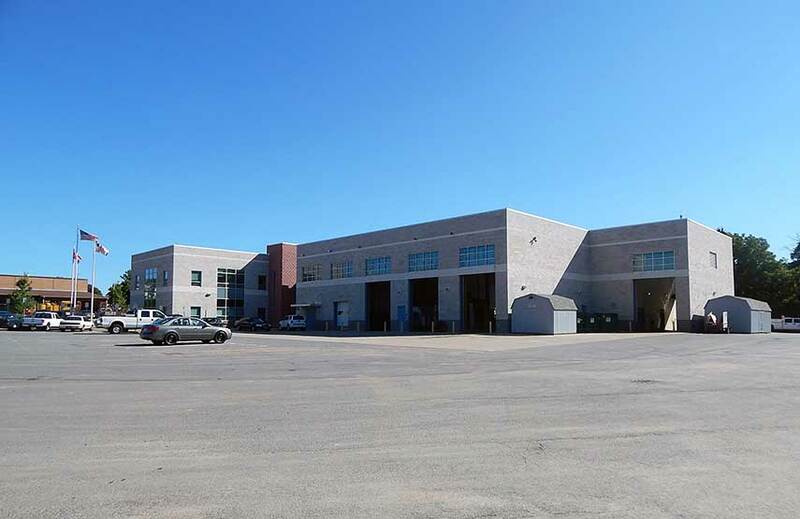 ADTEK provided design services for a 29,000-sf maintenance facility that includes a vehicle storage building facilities to store the center’s snow removal truck fleet, offices and bunk rooms for truck crews, salt storage building, vehicle repair facilities, locker rooms, restroom and shower facilities. The road-salt storage barn building was designed to allow trucks to be loaded within the new building structure. 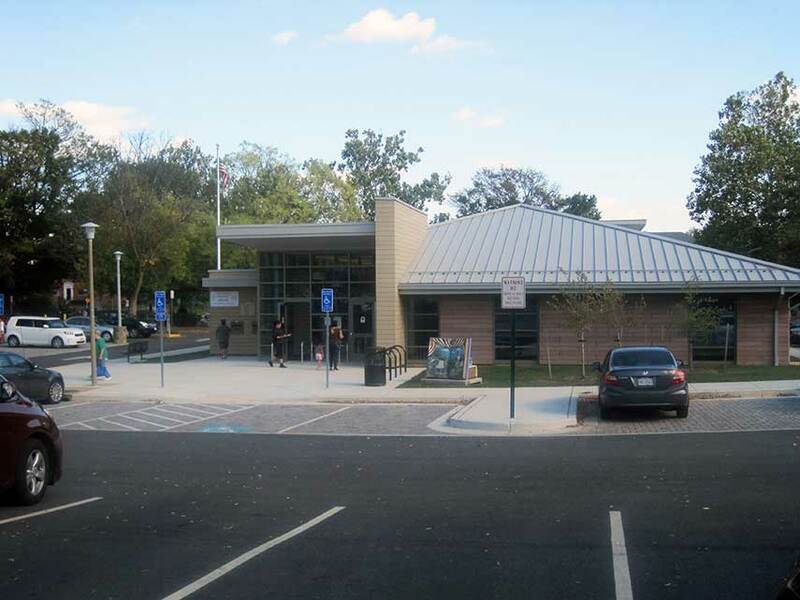 ADTEK provided design services for the renovation and minor expansion of the 12,200-sf library. 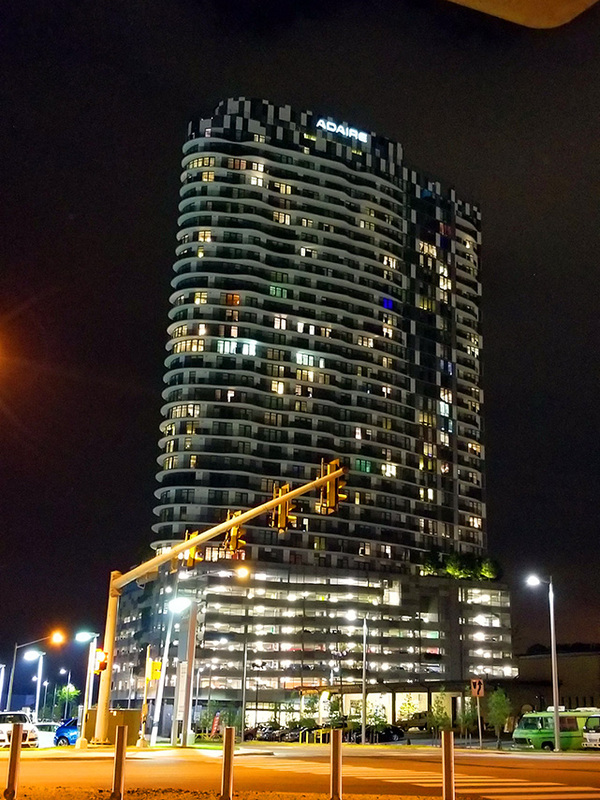 The project was completed in two phases, with phase one including a feasibility study and phase two including design, permitting and construction administration. 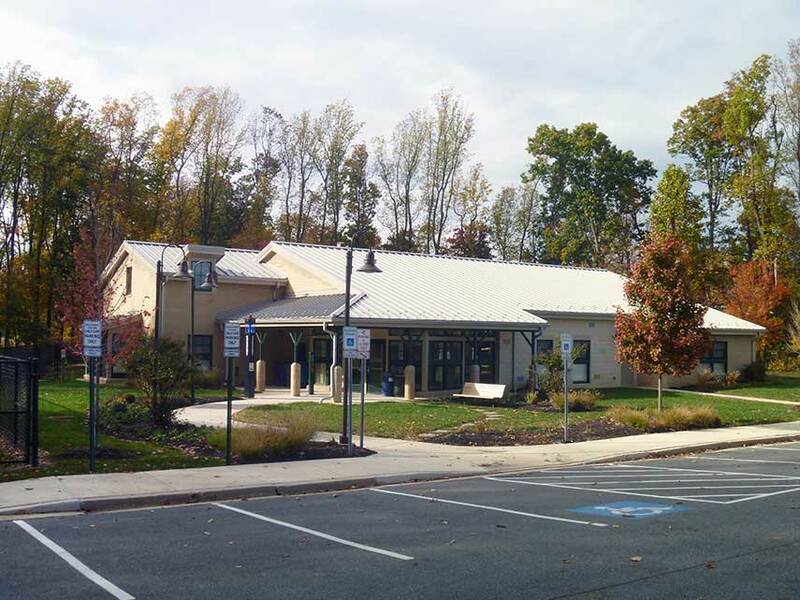 ADTEK provided design services for two additions and the modernization of the 16,474-sf library facility on a 2.5-acre site, increasing the facility to 22,574-sf. 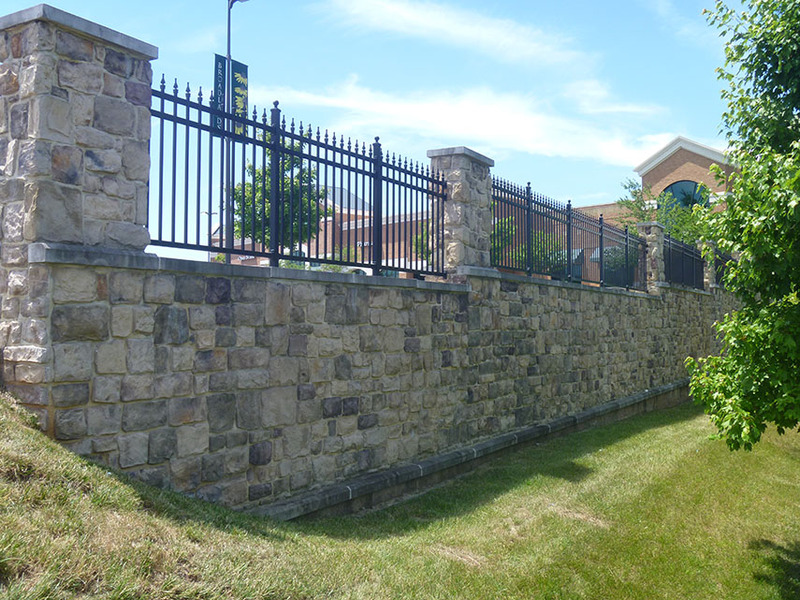 The project also included drainage improvements and the reconstruction of the parking lot. 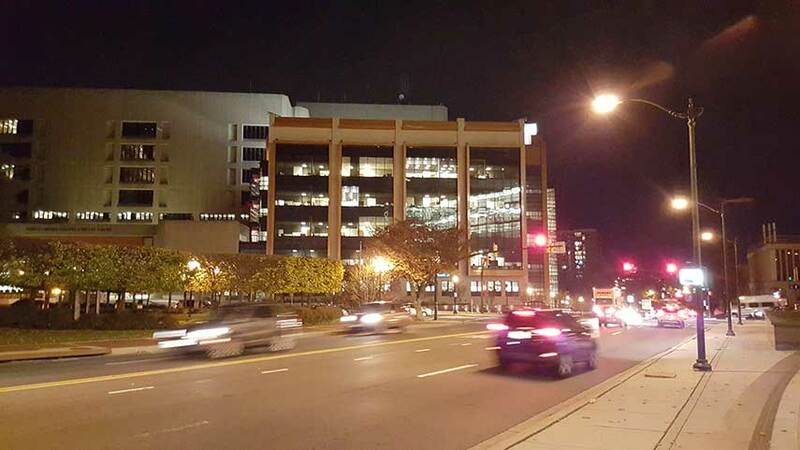 ADTEK provided design services for the new 20,000-sf library, constructed above an underground parking garage, to compensate for and utilize severe site grades. 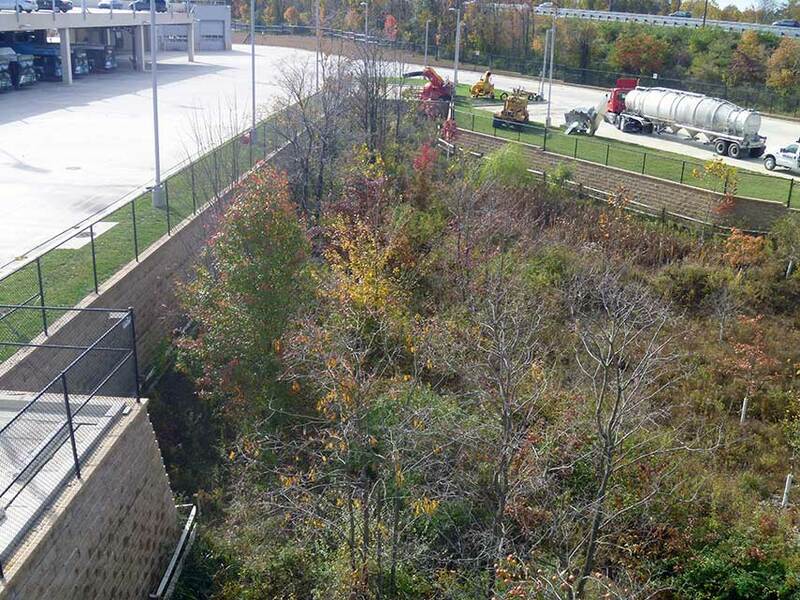 Innovative stormwater management strategies were used to limit disturbance of the heavily forested site, with the majority of the treatment and detention system within the void space below the garage floor. Client: The Lukmire Partnership, Inc. and Dell Perry, Inc.
ADTEK provided design services for the new 20,000-sf library, including significant work to dedicate property to the public right-of-way, widen and improve the existing ditch-section roadway to meet current County and VDOT standards, and to construct a new site entrance. This unique facility utilizes barrel vaulted roofs with curved steel beams supporting laminated wood deck. 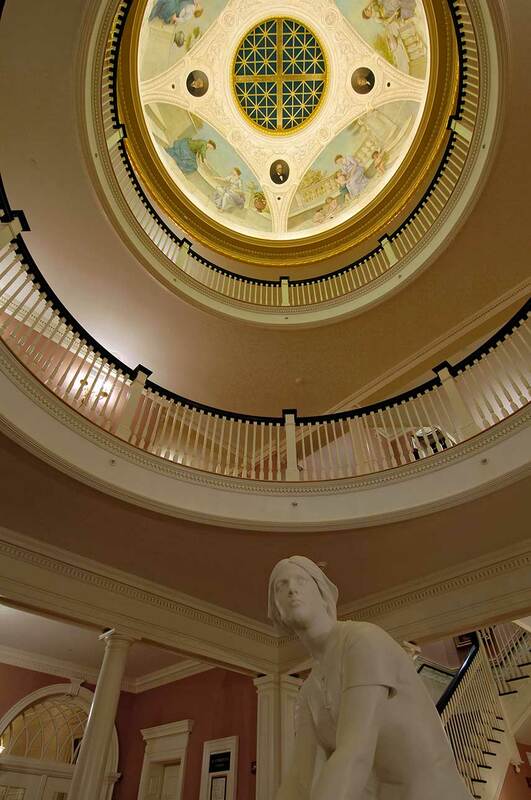 ADTEK provided structural design services for the renovation of the first floor Public Hearing Room located in the East Wing of Winchester Hall. Winchester Hall was originally used as a small girls school, and now is home to the Frederick County, MD Government. 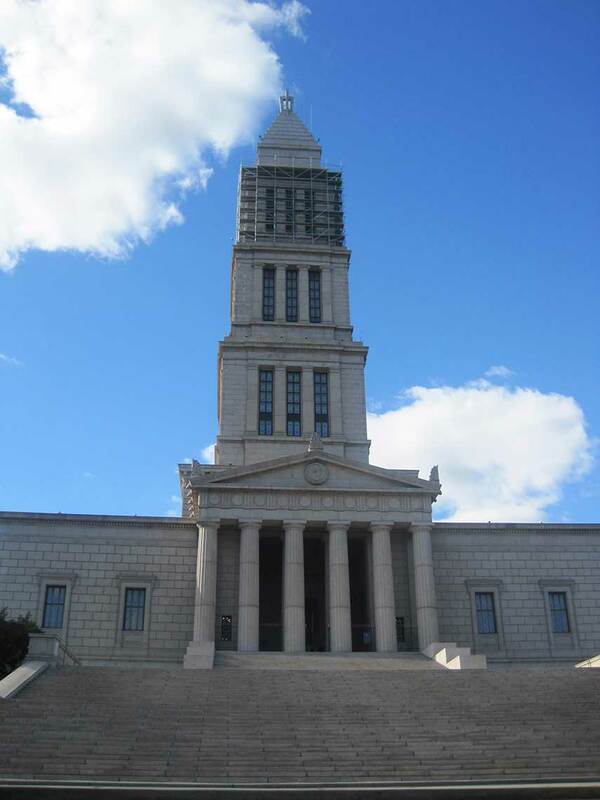 ADTEK provided structural engineering design services for the renovation, in anticipation of the George Washington Masonic National Memorial Association's 100th anniversary. 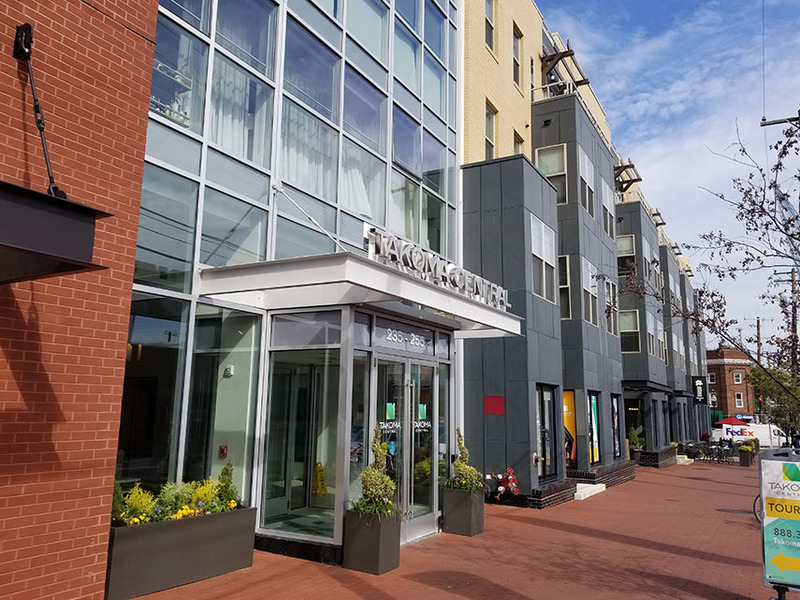 As part of the total renovation, ADTEK’s engineers provided design services for an exterior handicapped accessible ramp and an interior handicapped access lift within the existing historic atrium. 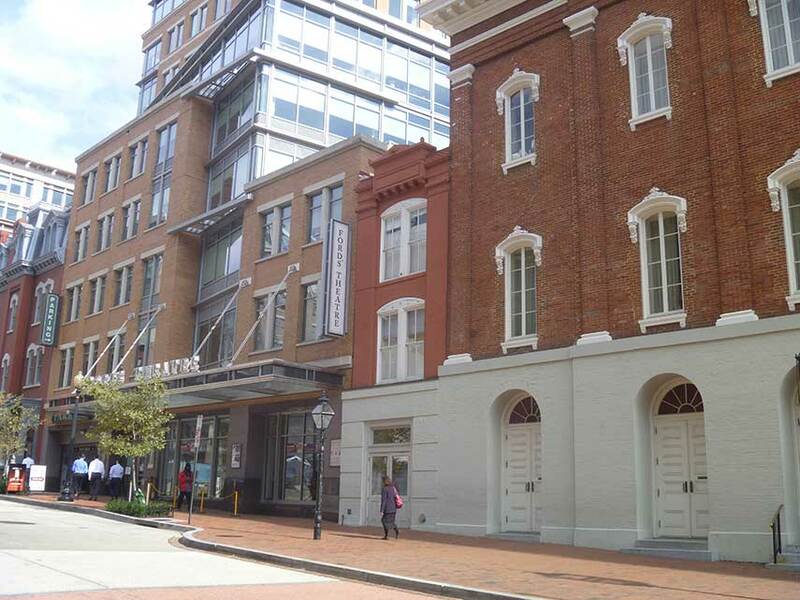 ADTEK provided structural design services for the renovation of three buildings at the Ford’s Theater Complex to include building 517, Ford’s Theatre and the Star Saloon. It was the largest renovation to the 150+ year old theater since it underwent restoration in the 1960s. The renovation improved access for the disabled and enhanced/modernized the theater. 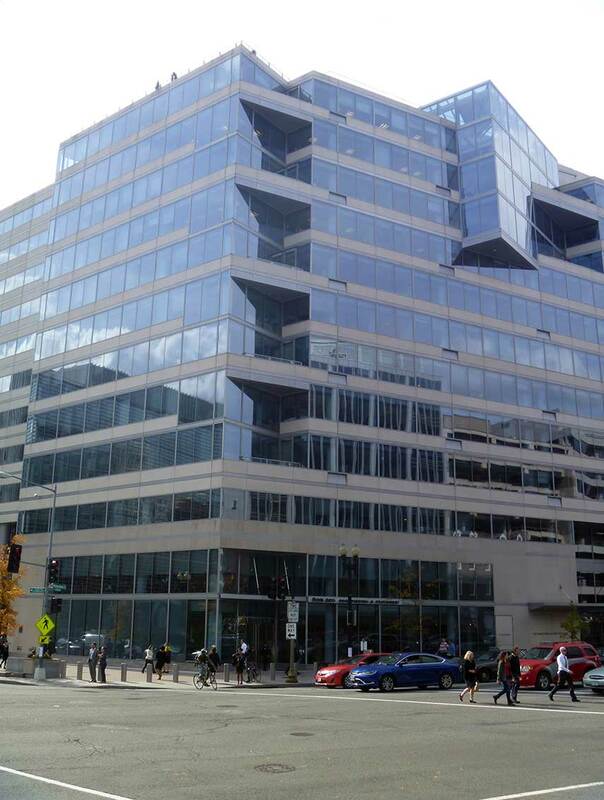 ADTEK provided structural design services for the adaptive re-use of a property in Capitol Hill. The parcel includes two structures – one is a stone and timber framed church at 609 Maryland Avenue constructed in the late 1800s that fronts onto Stanton Park. 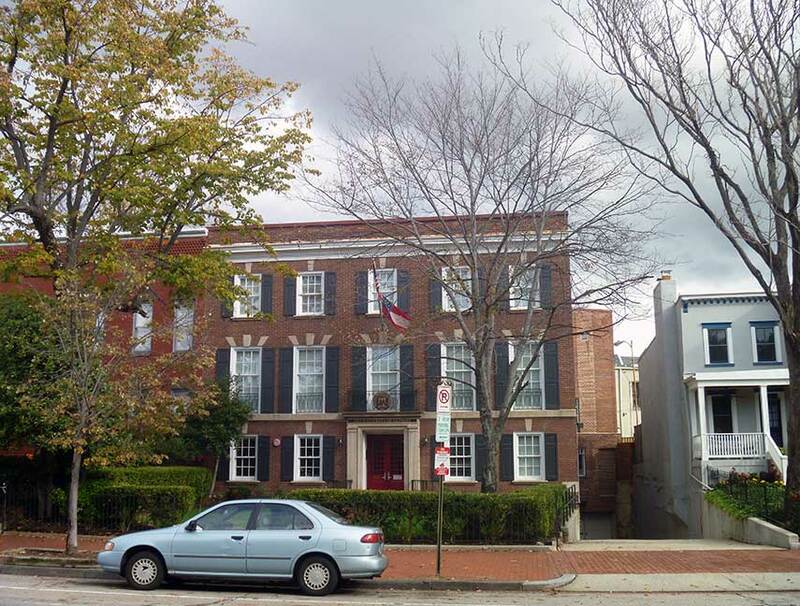 Adjacent to it on the same property is a row house at 611 Maryland Avenue. 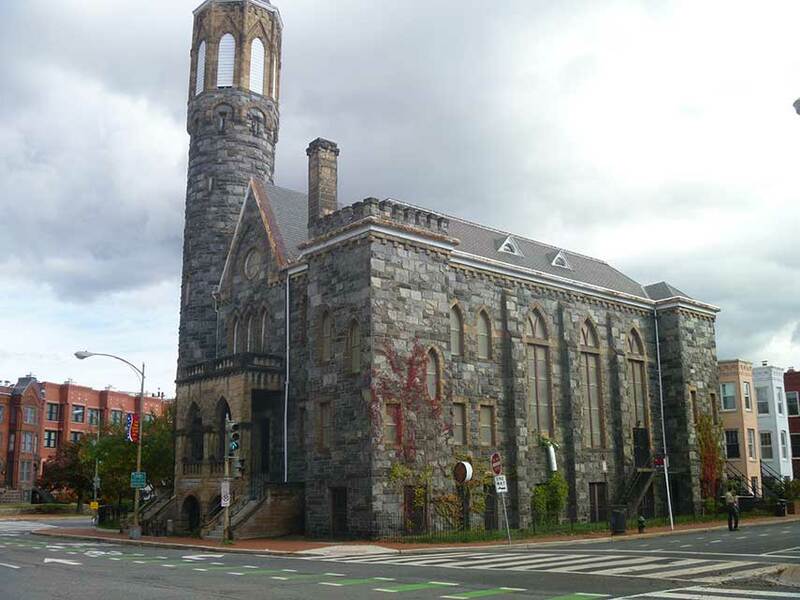 The developer wished to convert the church into six residential units and renovate the row house for sale as well. 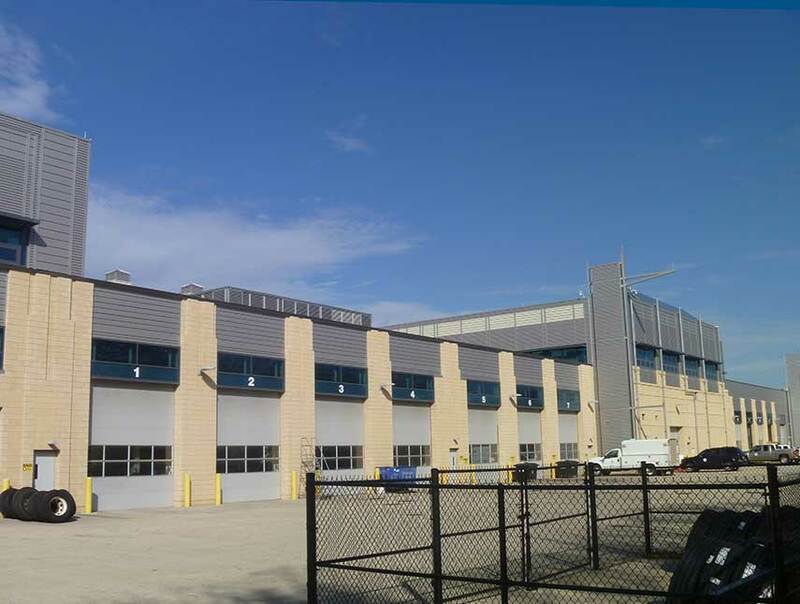 ADTEK provided design services for the adaptive reuse of an existing historic building. 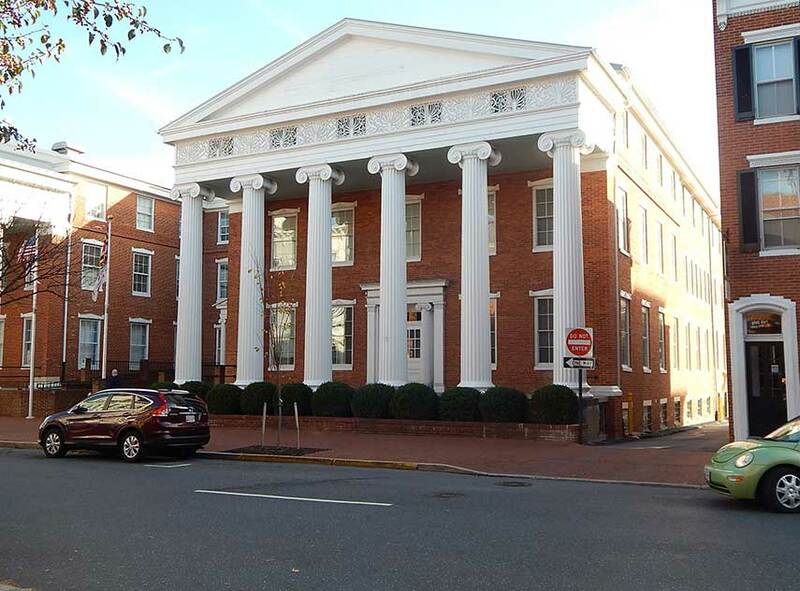 The three-story building was transformed into housing for the University of Georgia's Washington DC Studies Program. Delta Hall includes dormitory space for 32 students, in addition to full kitchens, student lounges and other student meeting spaces. The first floor has a reception area, office space and two classrooms. Recognition: Bronze Citation at the 2006 National Interiors Showcase Awards. ADTEK provided design services design for the new 83,143-sf building that includes 20 classrooms, 63 faculty offices, and 28 offices for the Provost and staff. 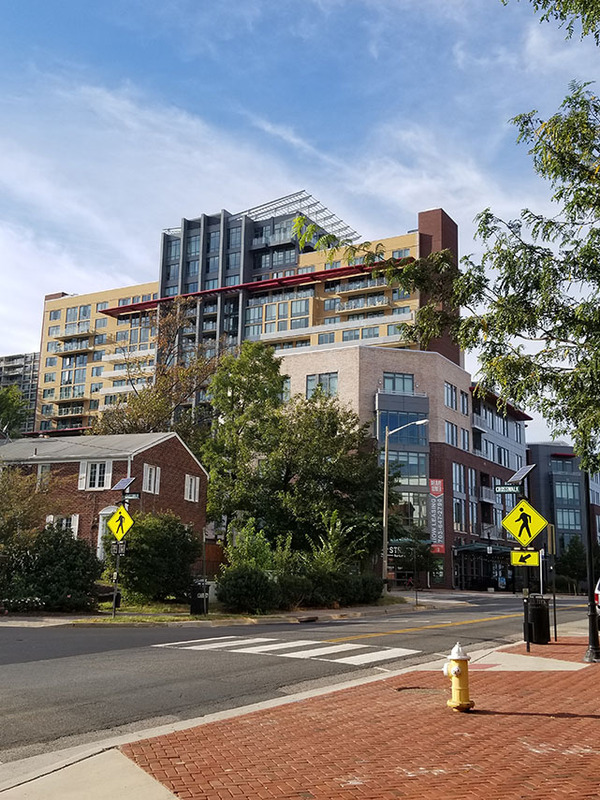 The project started as a renovation of the original 67,500-sf historic building, however, the building was destroyed by fire during the initial stages of the construction, and the new building was designed that replicated the original design but included an upgraded structural frame. 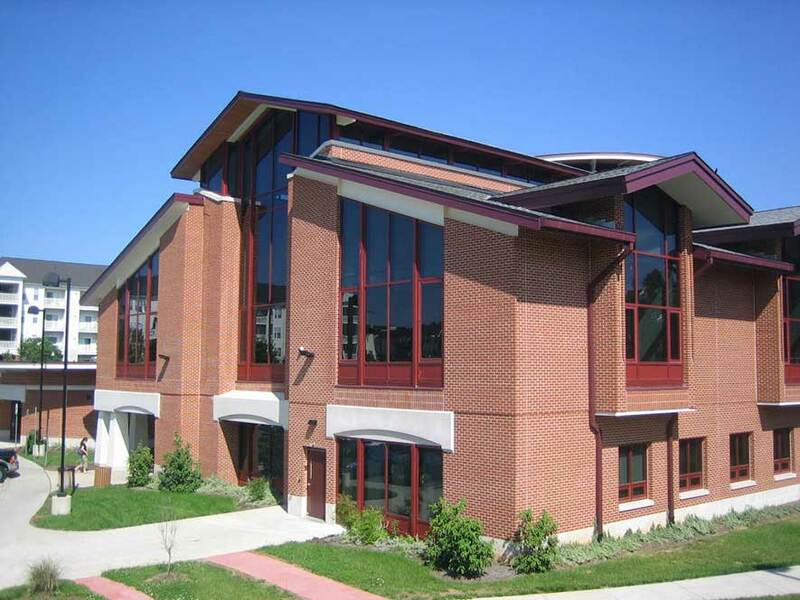 ADTEK provided structural cold formed framing design as part of the design for a new suite-style residence hall with multipurpose space and new outdoor space. The new residence hall will provide suite-style housing for approximately 225 students. 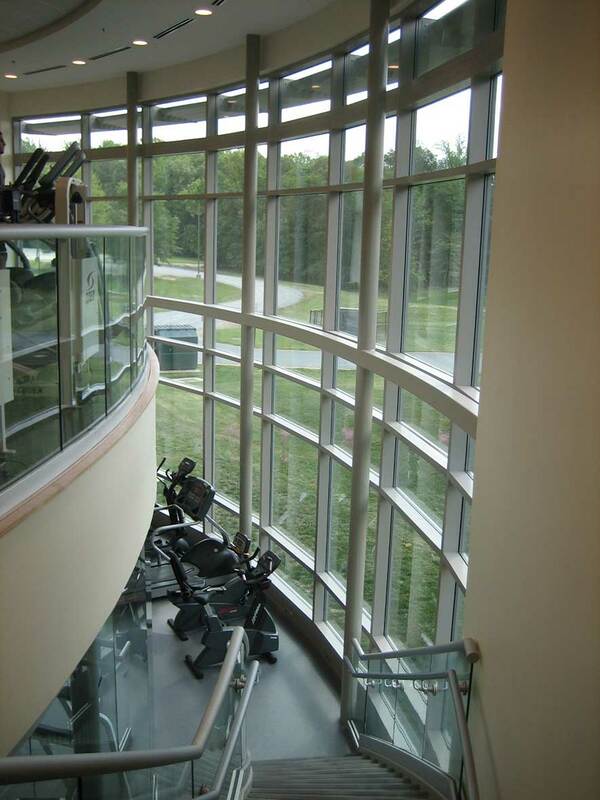 ADTEK provided design services for a new, 35,000-sf recreation building in the northwest corner of the campus. 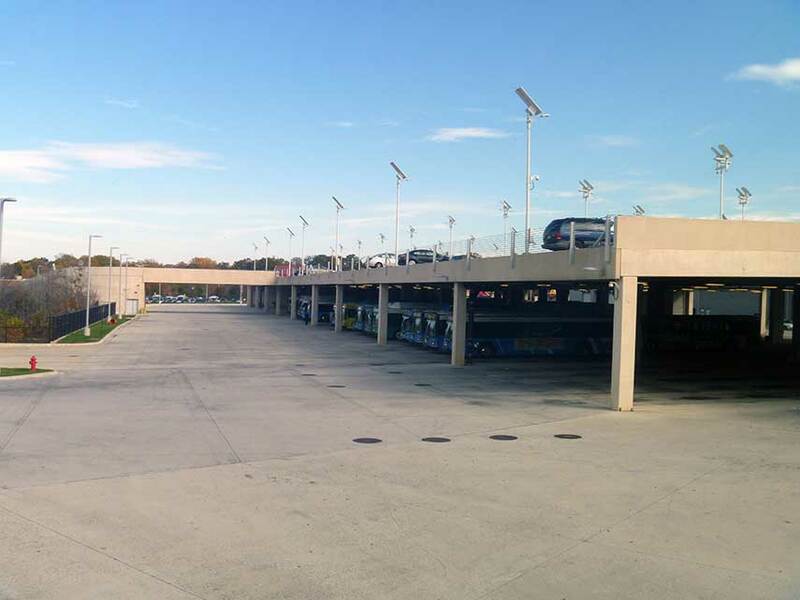 The project required the construction of approximately 150 new parking spaces adjacent to the new building. 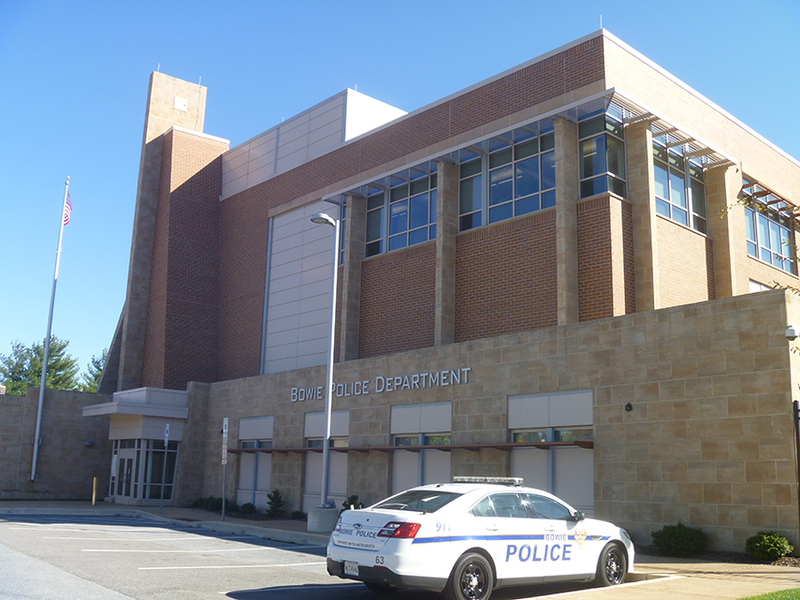 The project was design/build with a fast-track construction process. ADTEK provided design services for the new 80,000-sf Student Center, providing additional classroom and student service spaces. 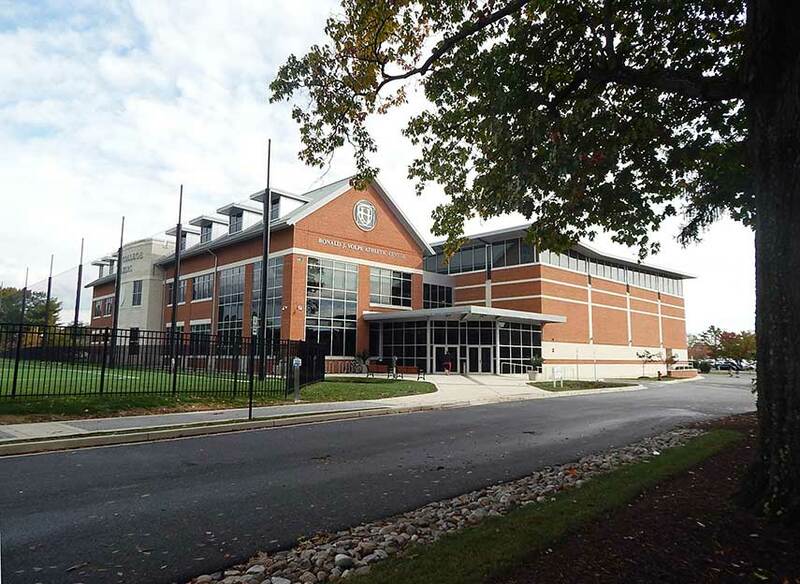 The facility also provided adequate faculty and adjunct office space to integrate academic and co-curricular activities as well as future program expansion with enrollment increases. 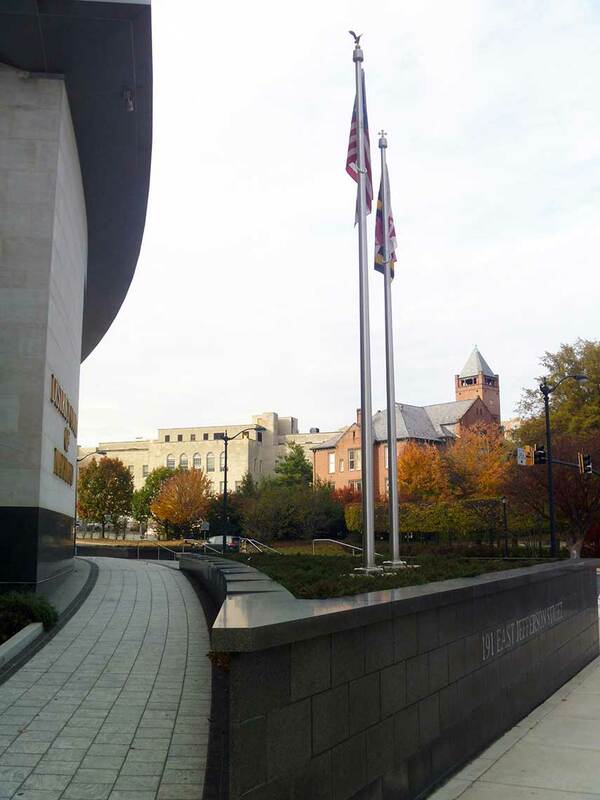 ADTEK provided design services for the renovation project, including the reconfiguration of the pedestrian mall and courtyard site. The existing historic courtyard had developed several drainage problems and the configuration was out of touch with modern usage patterns. 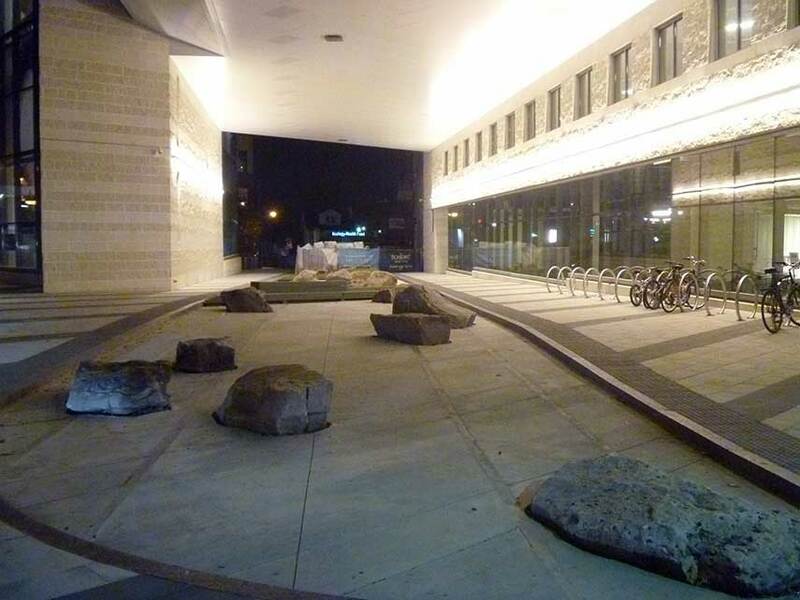 The project included the replacement of all existing concrete and paver systems, removal and replacement of an existing seating area and reconstruction of the existing non-compliant ADA ramp system leading to the main building entrance. 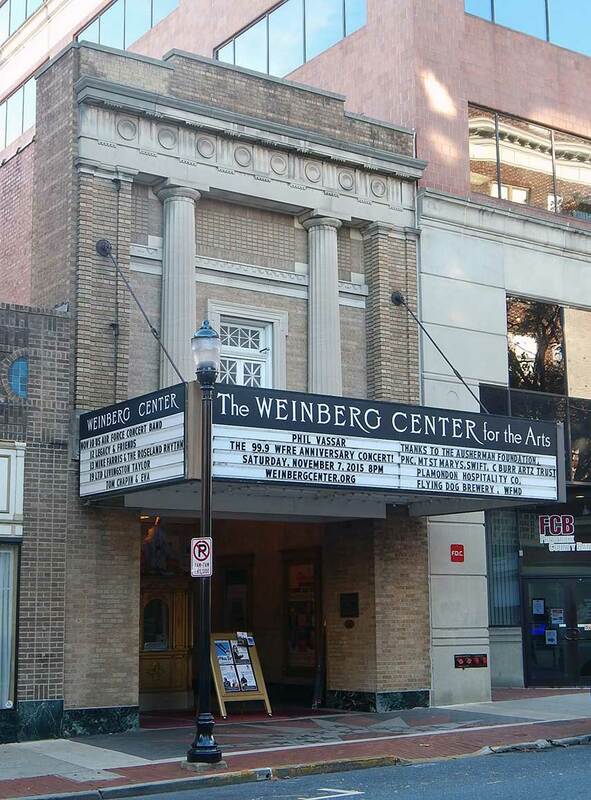 ATEK provided engineering design services for the renovation of the historic Weinberg Center for the Performing Arts, formerly known as the Tivoli Theatre. 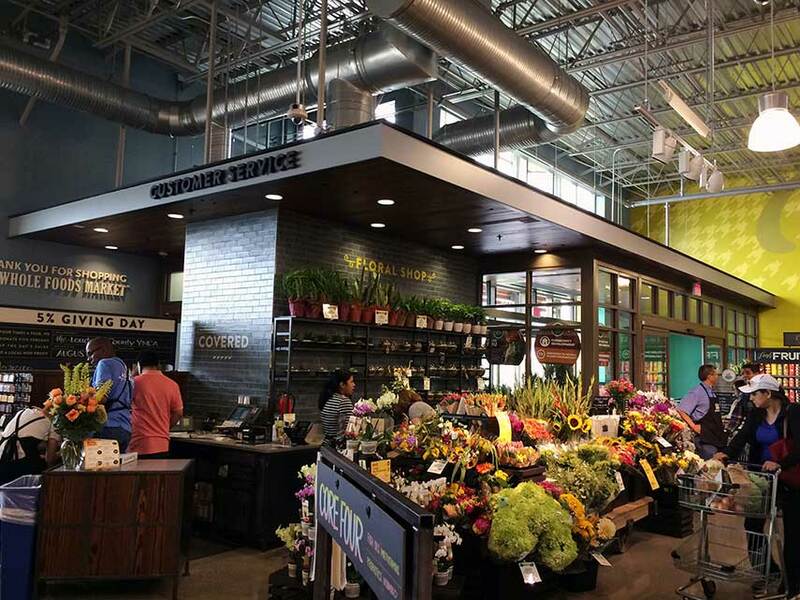 The renovation included the evaluation and replacement of the existing HVAC system. ADTEK provided assistance for the exploration of locating any on-grade mechanical/electrical equipment on the site, and analyzing the existing roof framing for new equipment. 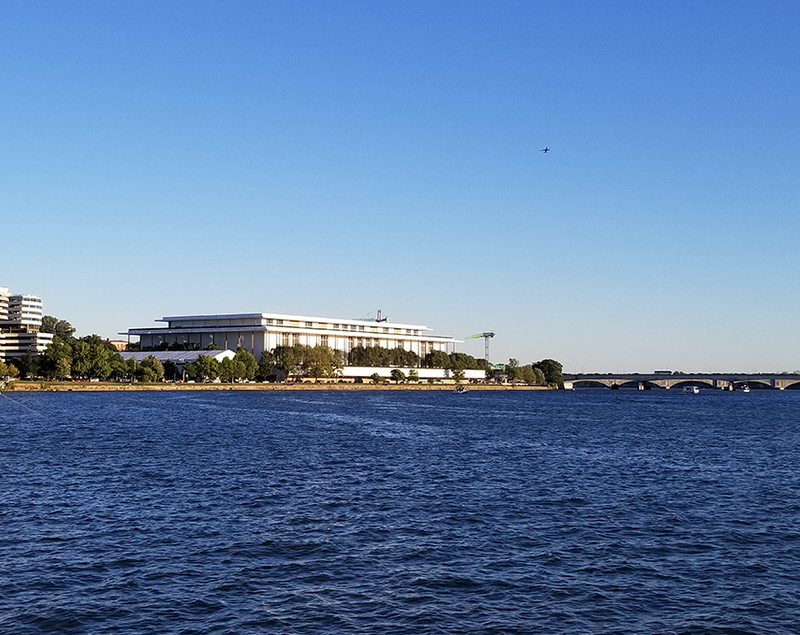 ADTEK served as part of a team on an AE IDIQ contract for the Kennedy Center for the Performing Arts, providing miscellaneous civil/site design services. 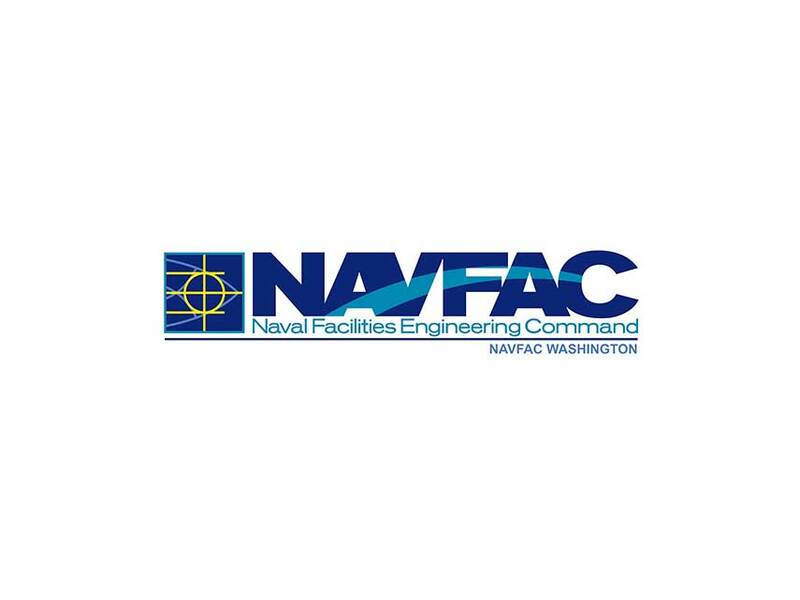 Tasks included exterior site drainage evaluations associated with correction of interior leakage problems, as well as the evaluation of existing drainage conditions and concept design of suggestions for improvements to improve slow-drainage areas. 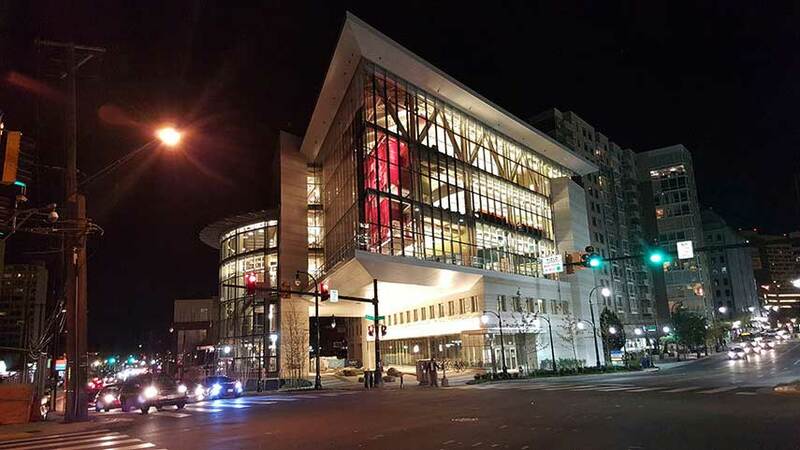 Client: Hughes Group Architects and Capital Drywall Inc.
ADTEK provided civil design services for this 86,000-sf performing arts center for George Mason University’s (GMU). 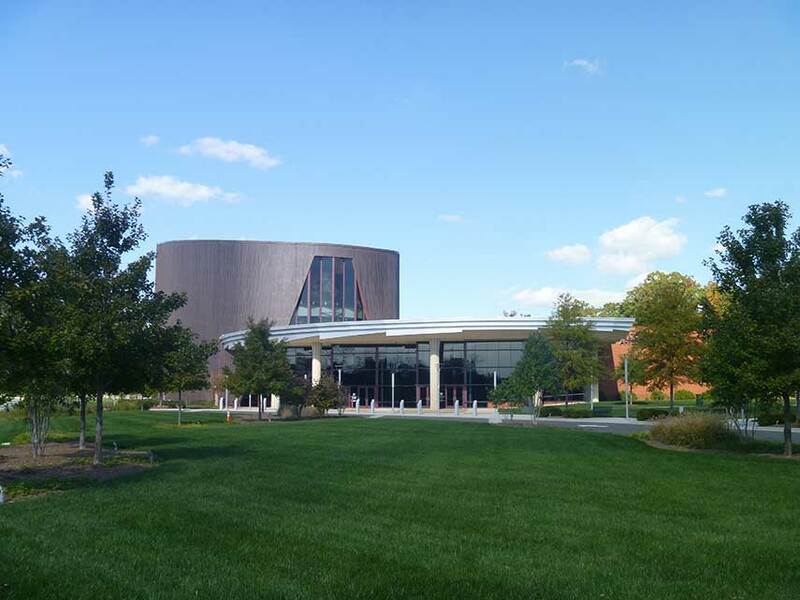 The center is a four-story, 1,100-seat performance hall and is the centerpiece of a larger cultural complex at GMU's Prince William campus. 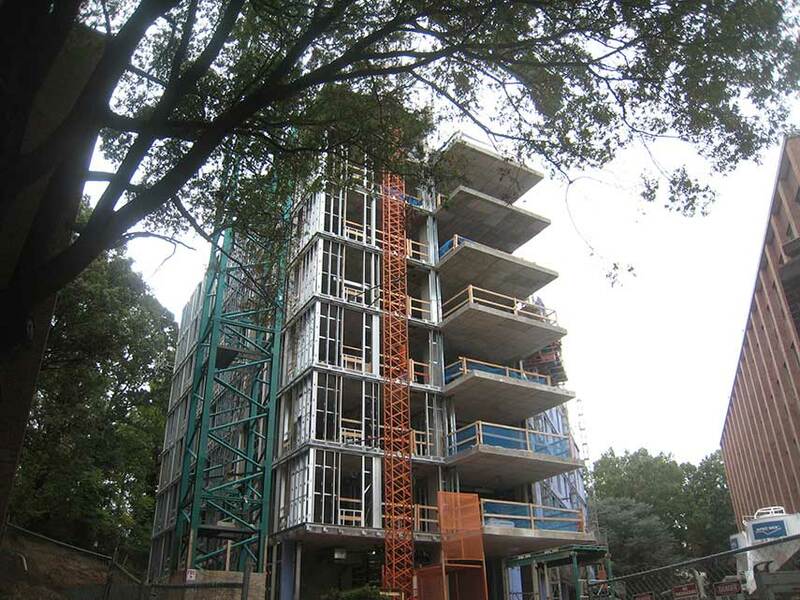 ADTEK's specialty engineers provided structural cold formed framing design for the project. 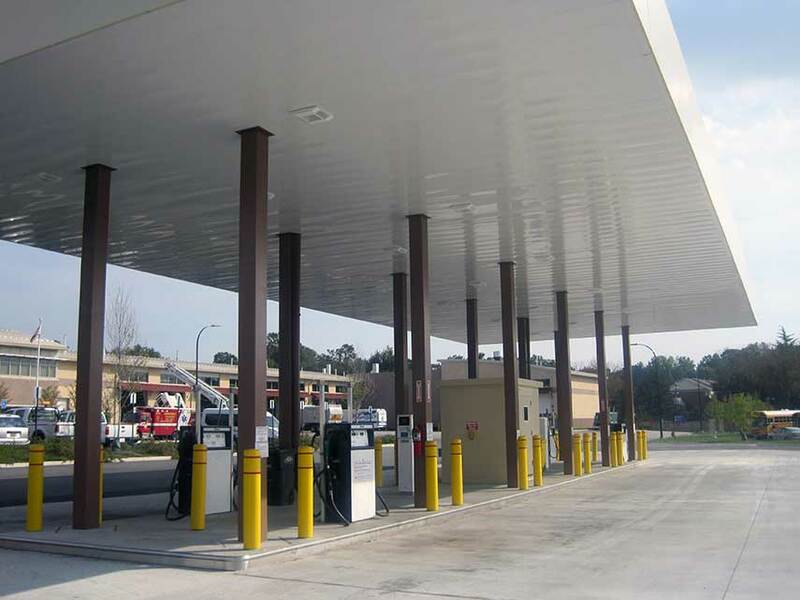 ADTEK also provided civil design services for an addition that was subsequently planned. The addition was designed by Cho Benn Holback & Associates. 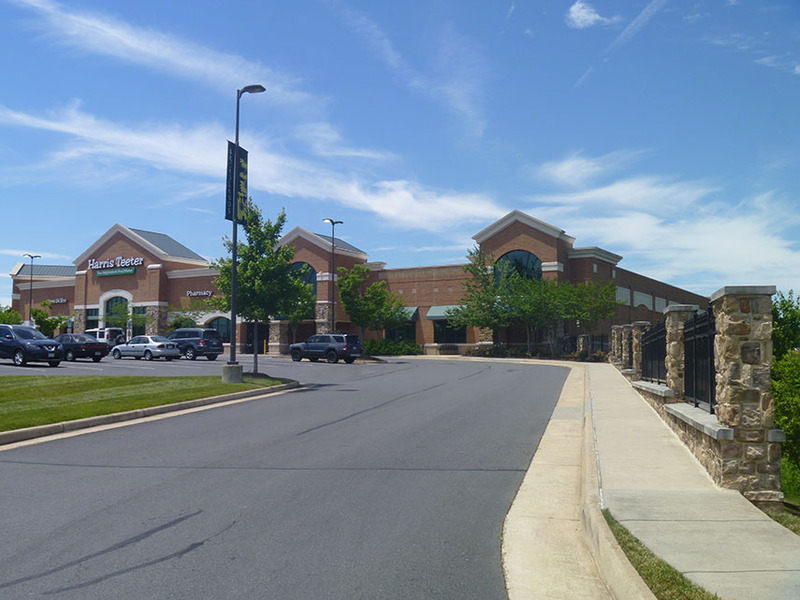 ADTEK provided civil engineering services for the 33,000-sf center. 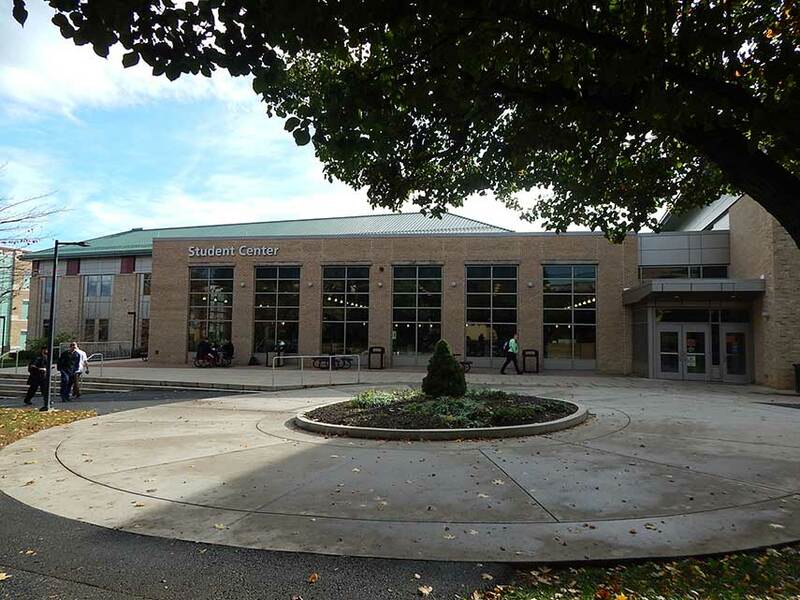 The facility includes a gymnasium, exercise room, social hall, kitchen, senior/community lounge, arts/kiln room, game room, vending space, conference room, offices, lobby, restrooms, activity room, multi-use athletic court, and storage space. 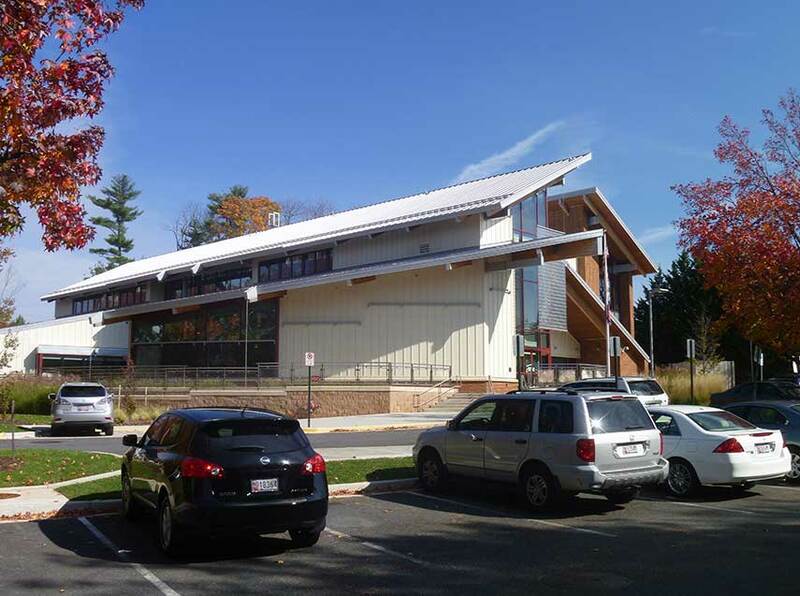 ADTEK provided engineering design services for this two-story, 7,000-sf fitness addition to an existing recreation center. 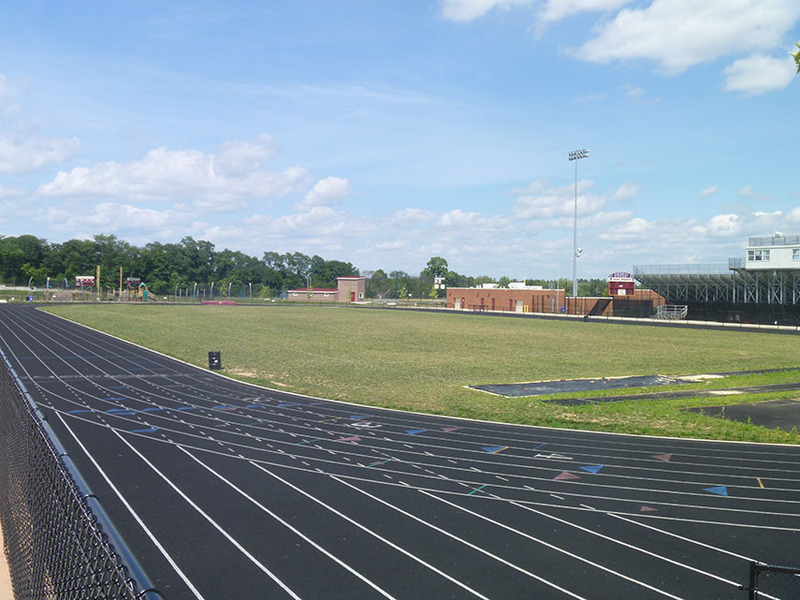 The 182 acres surrounding South Run offer soccer and baseball/softball fields, two tennis courts, two outdoor basketball courts, a field house with newly installed athletic turf playing surface, accessible playground, and an off-leash dog area. 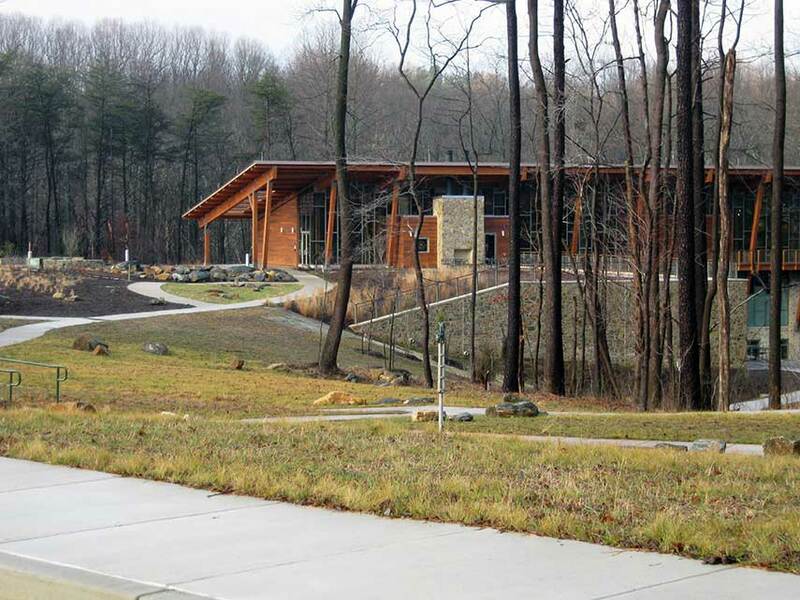 Paved trails connect the recreation center with Burke Lake Park and Lake Mercer. 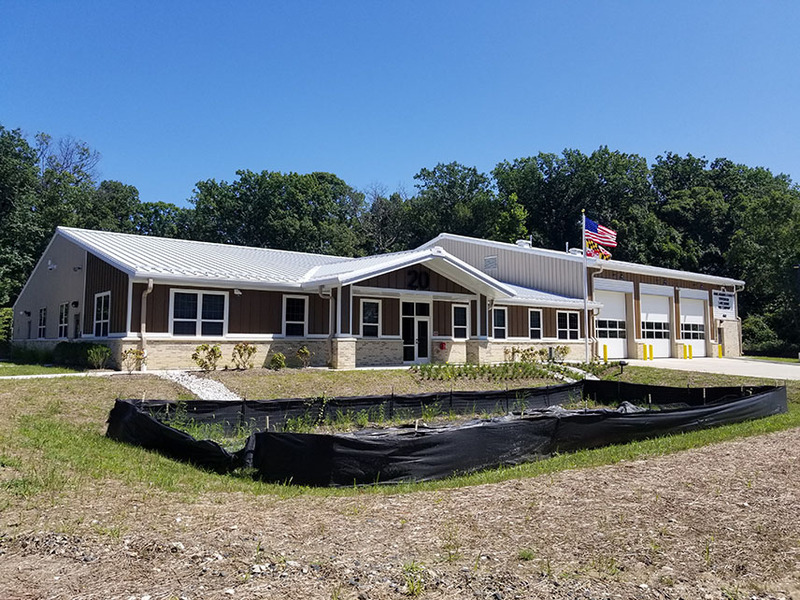 ADTEK provided civil engineering services for a modern, 17,000-sf nature center with indoor exhibits and displays, along with roads, parking, and outdoor interpretive trails. The trails are used for outdoor education. The indoor exhibits and displays are both interactive and static. In addition to the main exhibit room, the Center has a large Discovery Room specifically designed for children’s activities with many “hands-on” exhibits and activities. 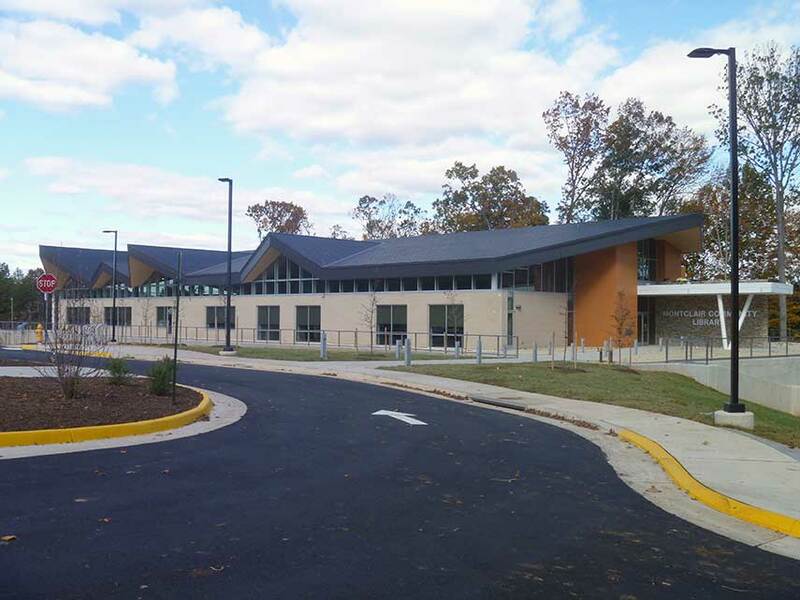 ADTEK provided structural design for the 110,000-sf new recreation center at the Prince William Institute, a multi-jurisdictional venture adjacent to George Mason University’s Prince William Campus. 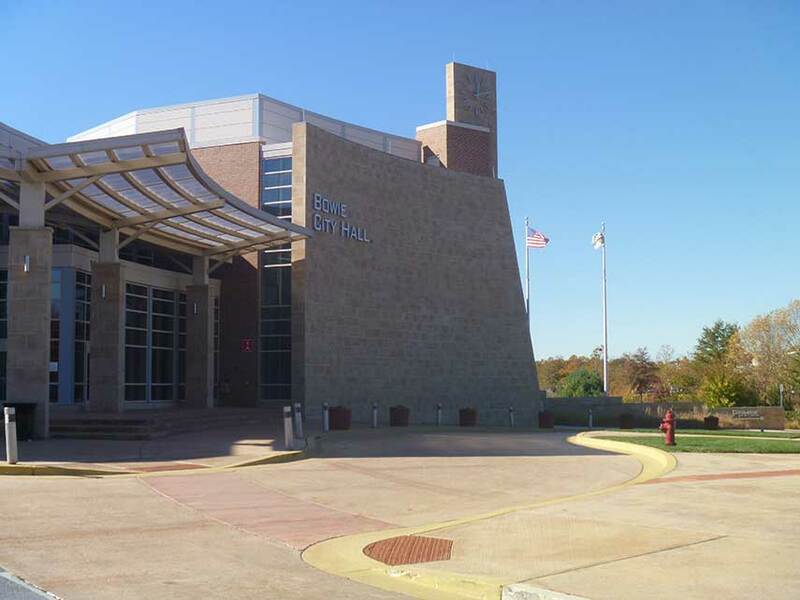 The facility features a natatorium (with diving pool and leisure pool), weight rooms, childcare center, locker rooms, aerobic rooms, and administrative offices. 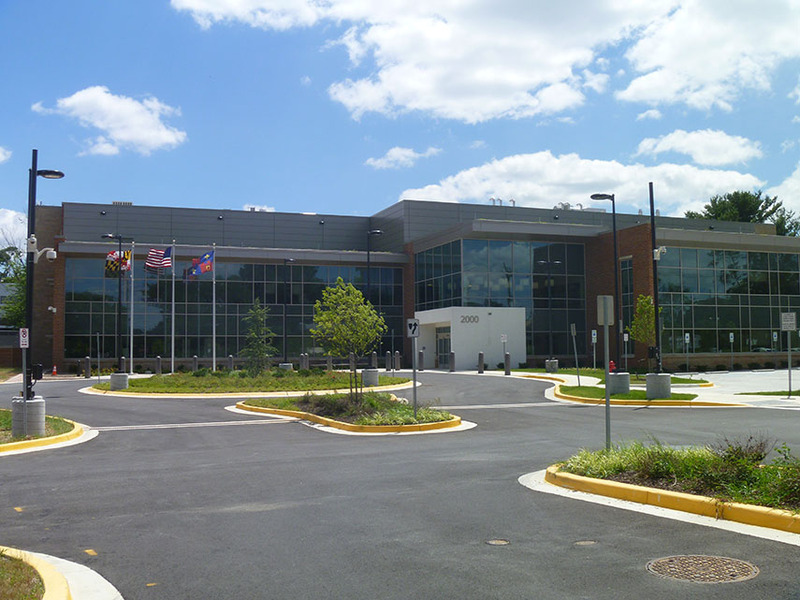 ADTEK provided design services for the modernization of the existing Center, with a basketball court, rehabilitated tennis court, site landscaping, and sidewalks. 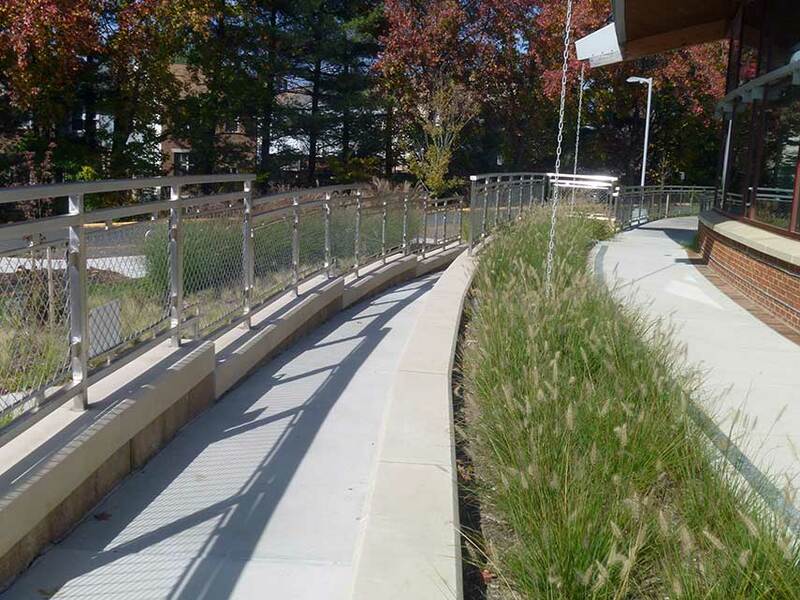 Site features include the addition of sustainability requirements, and the requirement that several features be made pervious. 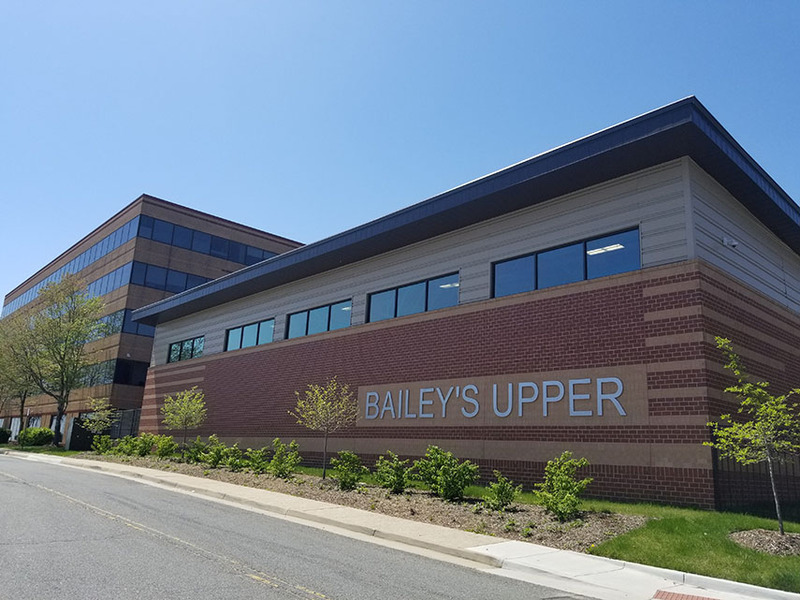 ADEK provided design services for the new 5,360-sf facility on a 2 acre site, including the immediate areas surrounding the building footprint. 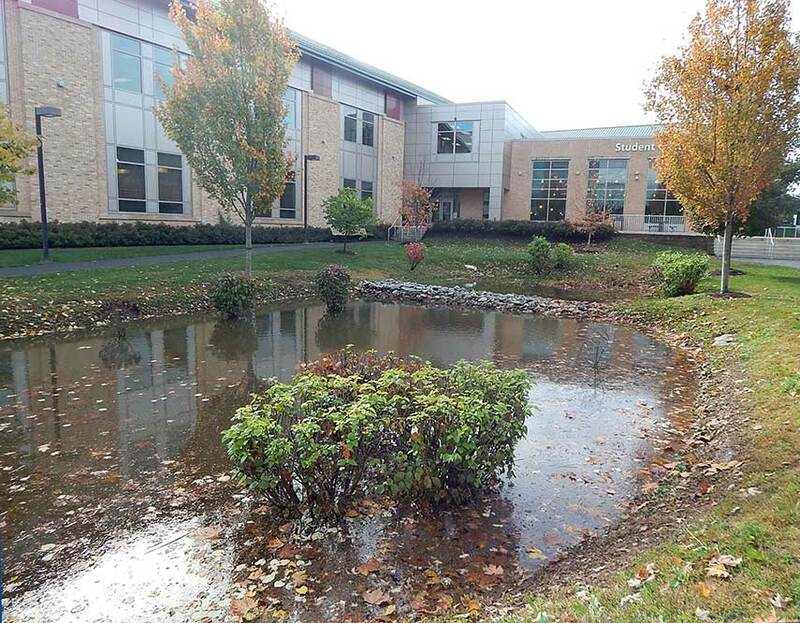 The project included stormwater management design, playground installation and water and sewer extensions. 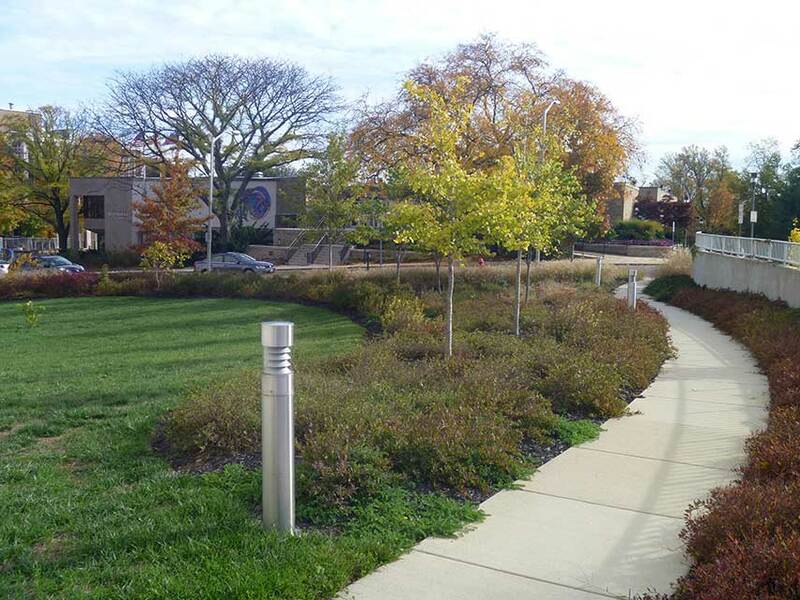 An ADA compliant path leads through a wooded area to the existing parking lot. 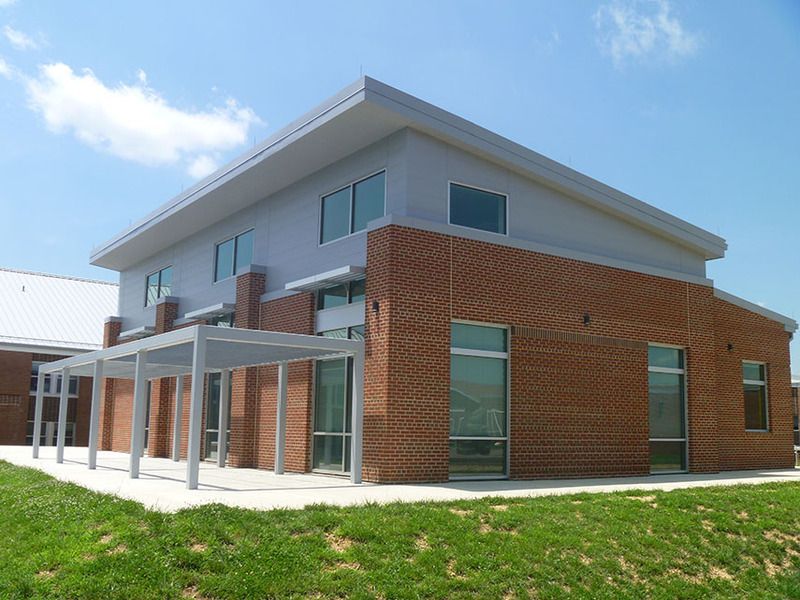 ADTEK provided civil engineering services for a 9,000-sf, six classroom child development center. The center has a capacity of 120 children. 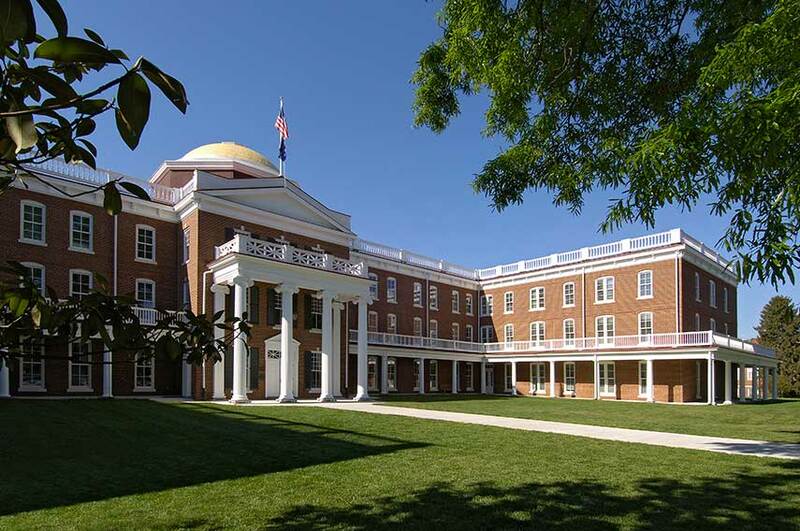 The design was in accordance with the standards of the BCOM and GMU Design Manuals. 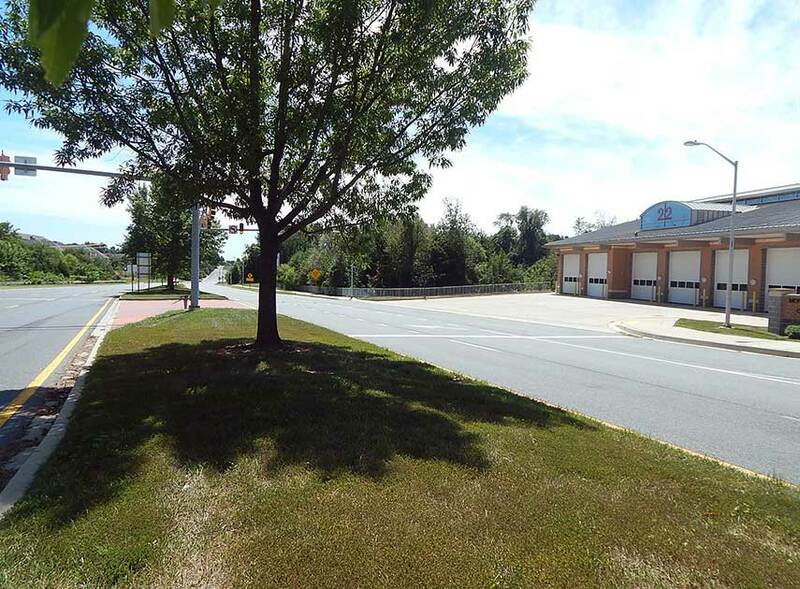 In addition, work on water distribution systems was coordinated and approved by the City of Fairfax, and work on the sanitary sewer system was coordinated and approved by the County of Fairfax. 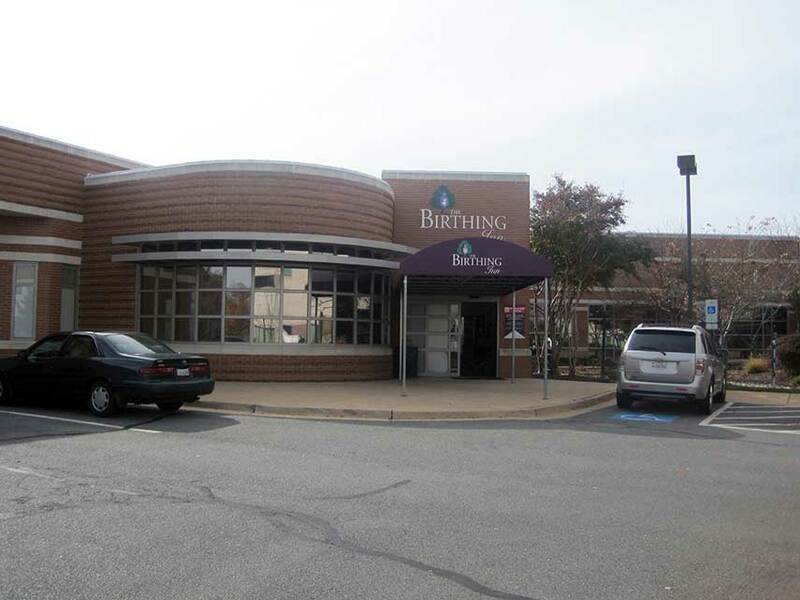 ADTEK, through a design-build contract, provided structural recommendations related to the schematic design of renovations and potential additions to the facility to accommodate approximately 7,350-sf of program space, including ADA upgrades, an elevator addition, review of possible roof truss systems, review of the impact of roof/attic mounted HVAC equipment, potential new exterior front vestibule, restoration to exterior finishes and foundation inspections and repair recommendations. 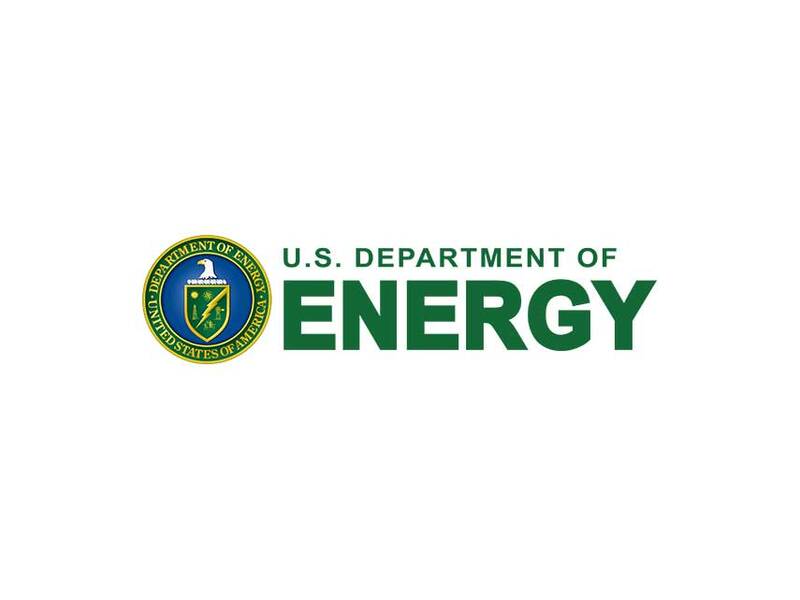 Civil engineering services included a site inspection and evaluation of existing conditions; review of all relevant zoning codes and design requirements and permitting of site improvements. 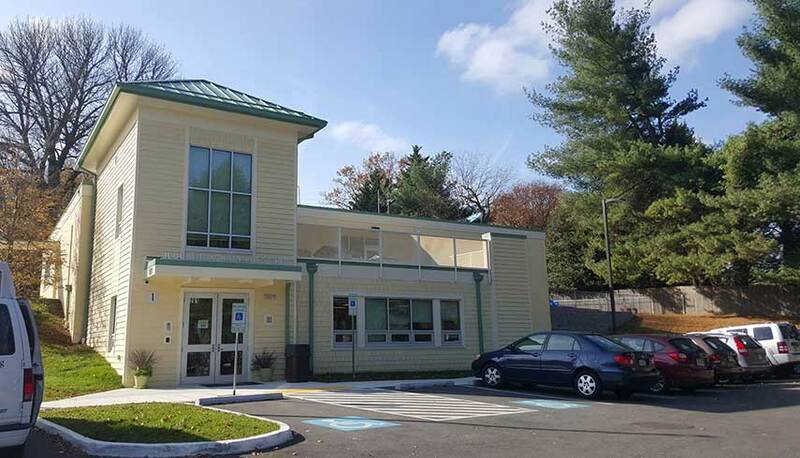 ADTEK provided design services for this new, one-story 21,194-sf structure with occupancy of 162 children and support staff. The structure is a pre-engineered steel building. ADTEK provided design related to the foundation and exterior wall design, based on loads provided by the pre-engineered building manufacturer. 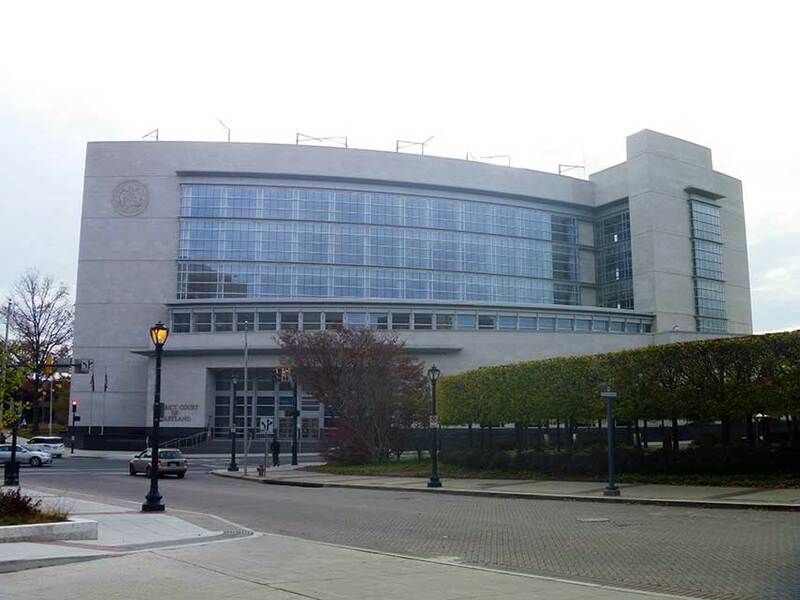 The new facility meets the latest Anti-terrorism Force Protection, ADA and Architectural Barriers Act standards. 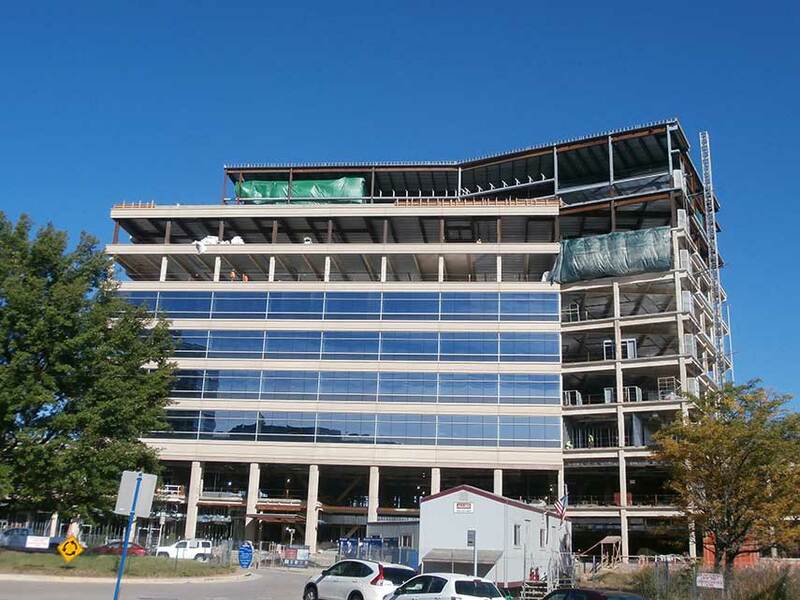 ADTEK's specialty engineers provided design for structural cold-formed exterior framing as well as the design for a slip connection at the top of interior non-structural framing.